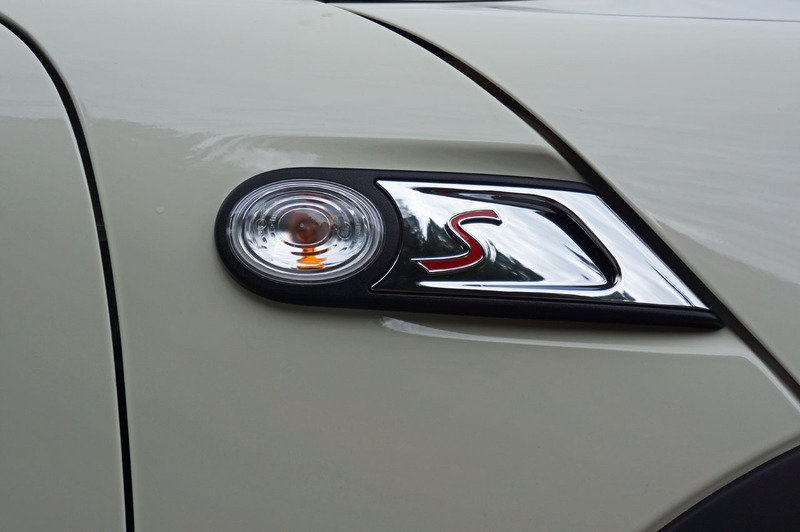 tag a bright shiny red “S” onto its nameplate. 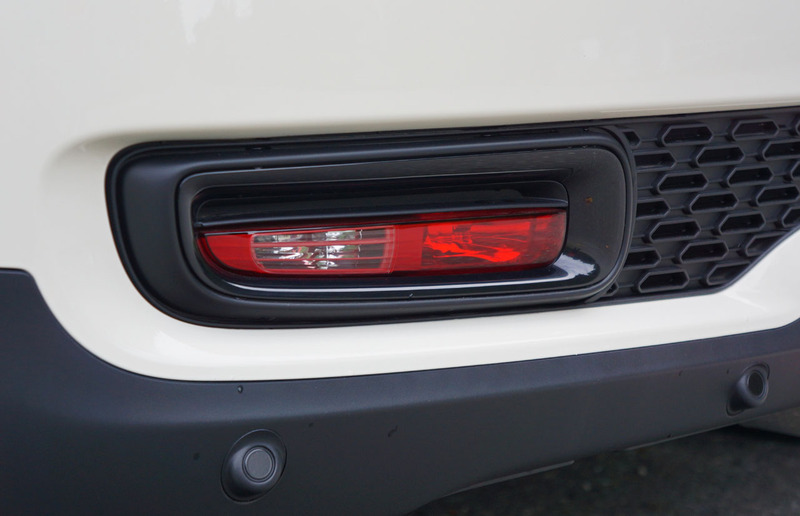 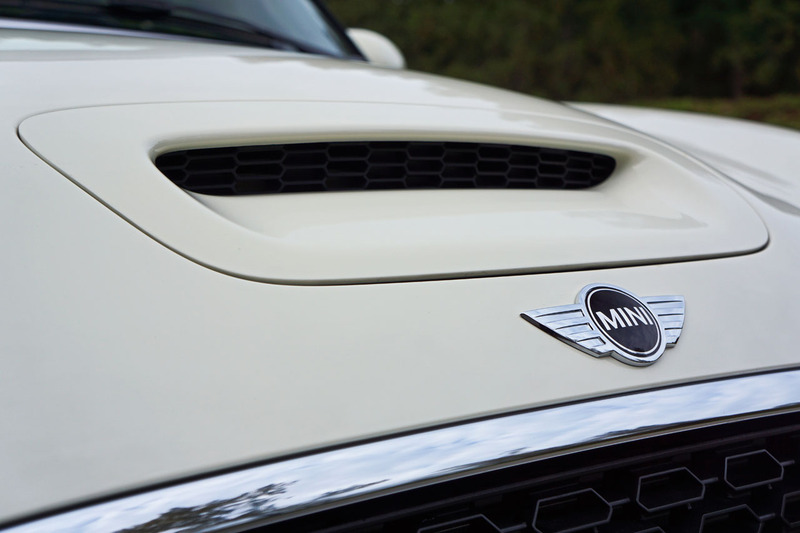 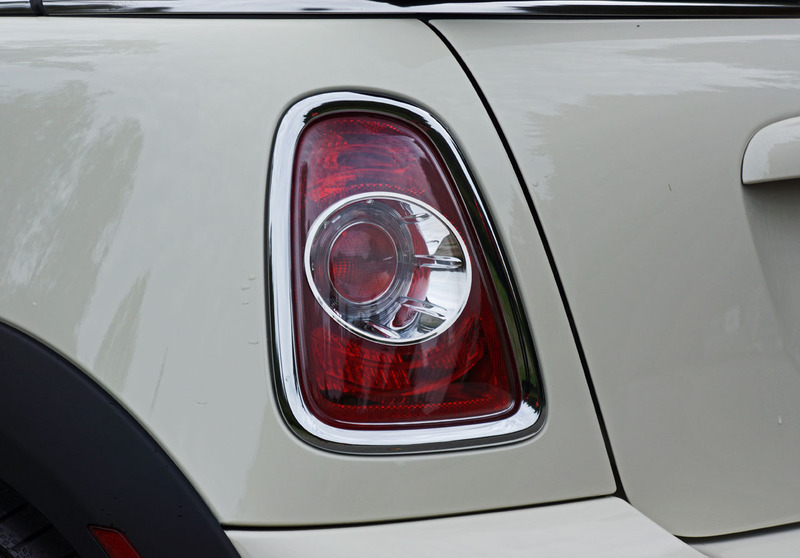 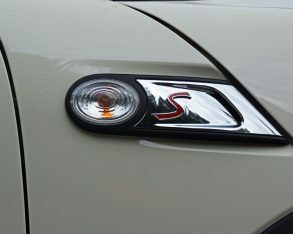 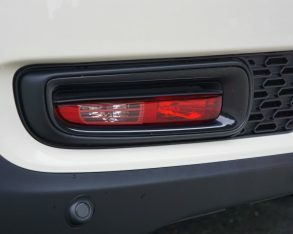 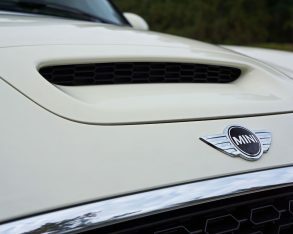 For years the stylized S on the backside of any Mini model has signified a very worthwhile performance upgrade, not to mention other goodies to go along with its increased price point. 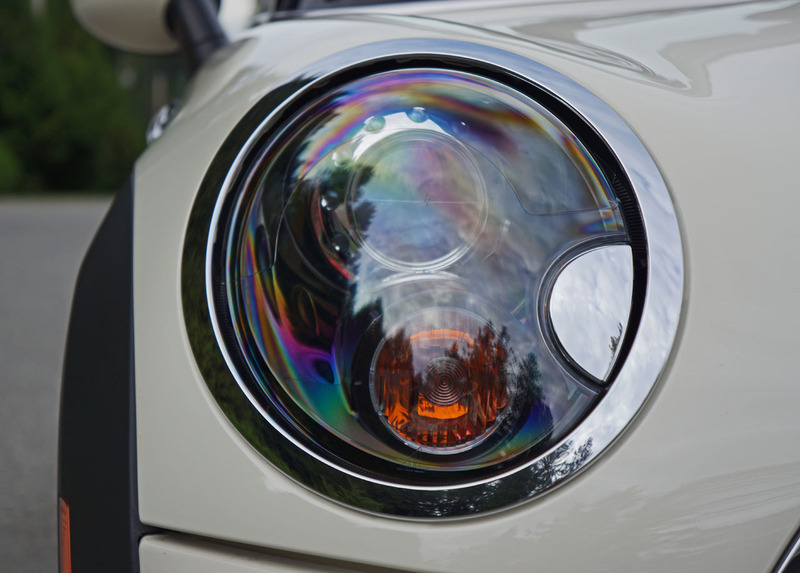 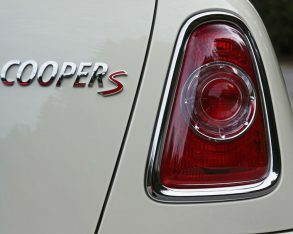 The best part is the received reward is much greater than the money needed to move up from the base Cooper, which is why there are so many S-badged Minis zipping around town. 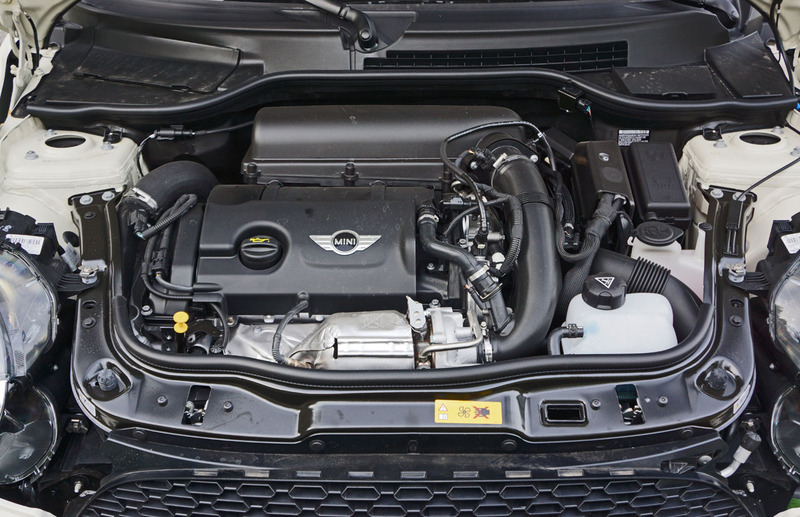 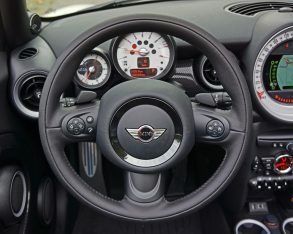 although on overboost the Cooper S gives its driver a 78 lb-ft advantage! 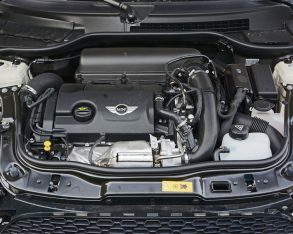 Sure, there’s more performance yet available in the John Cooper Works version, but that little 208-horsepower mind bomb requires a level of investment that makes it a rare sight. 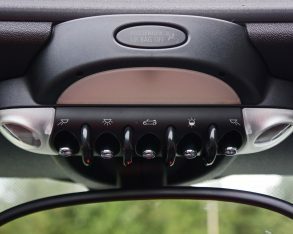 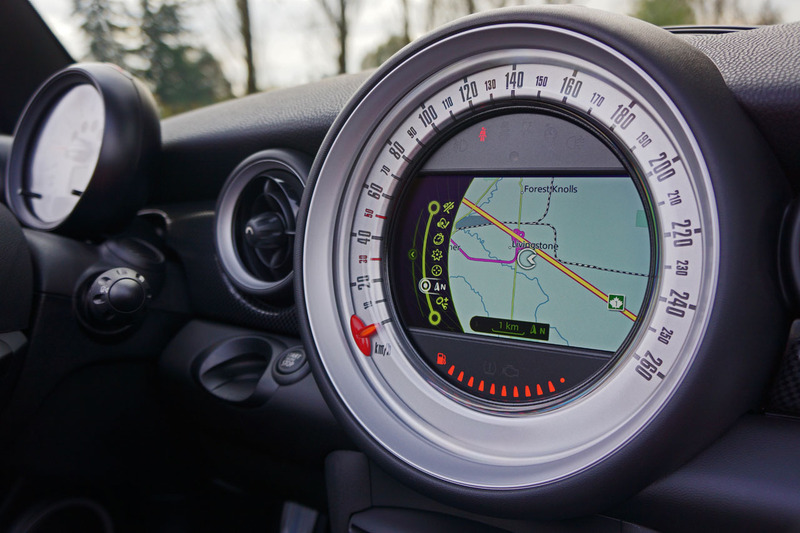 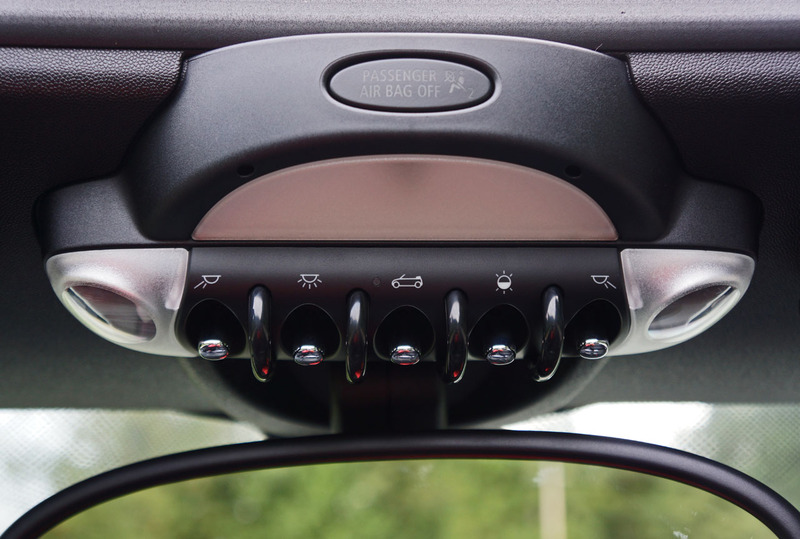 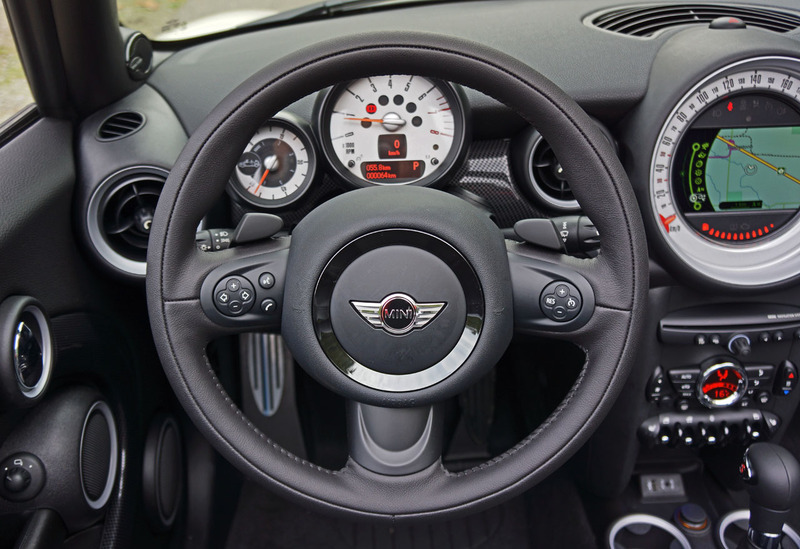 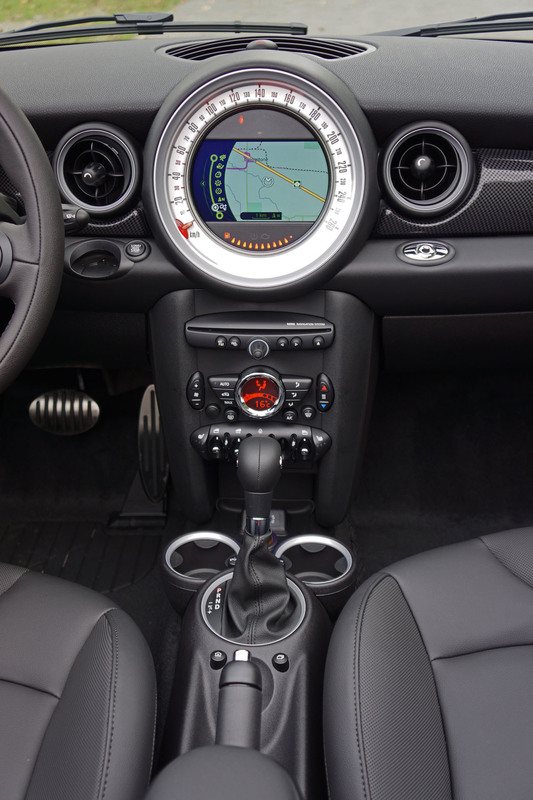 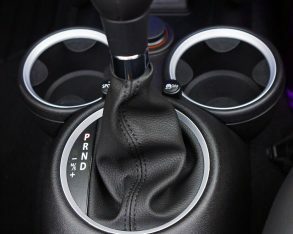 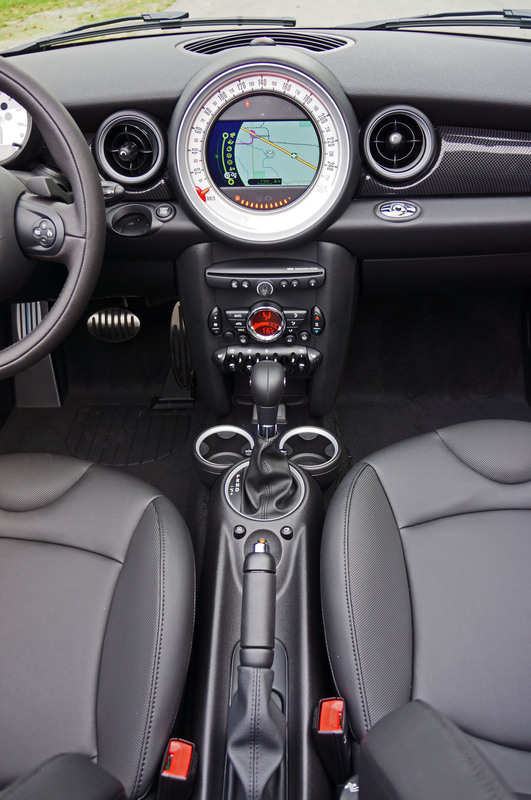 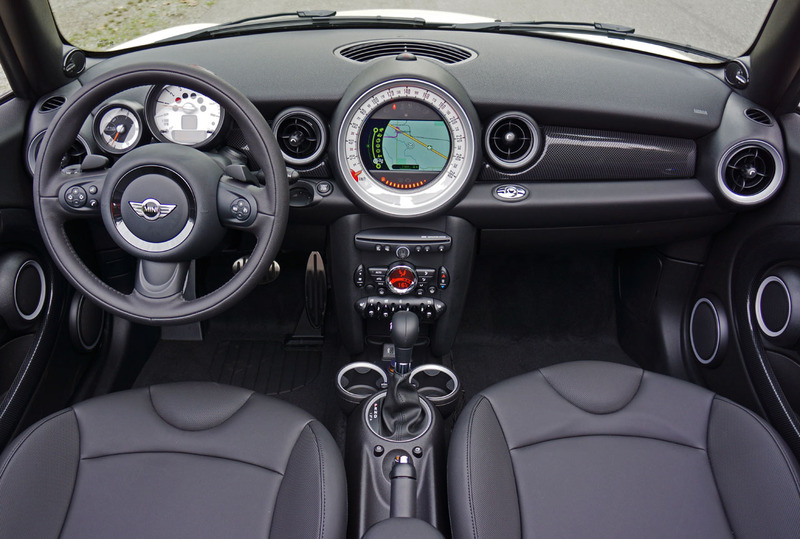 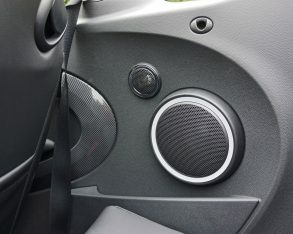 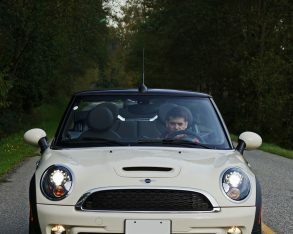 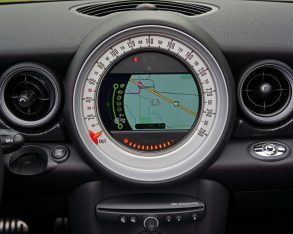 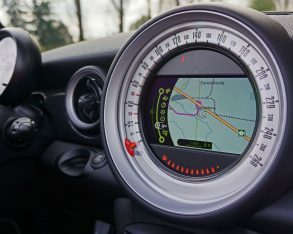 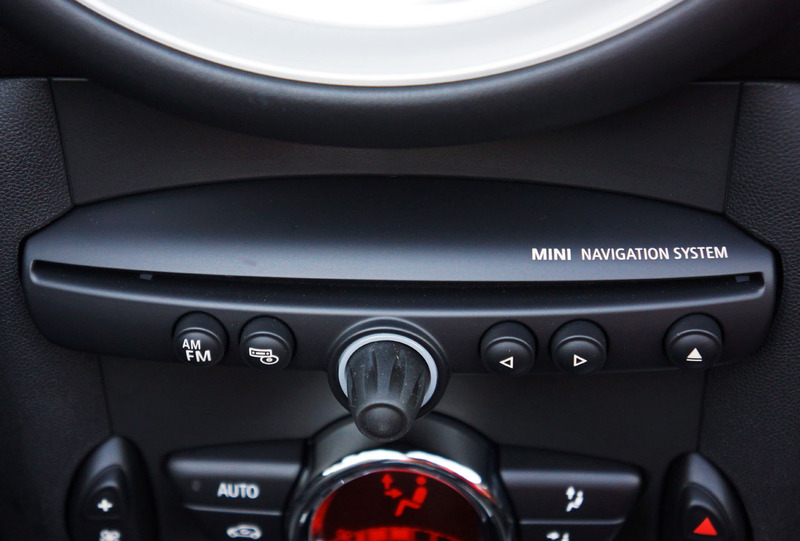 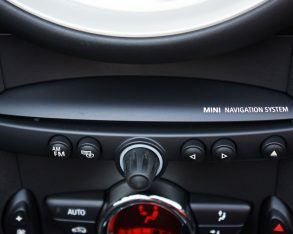 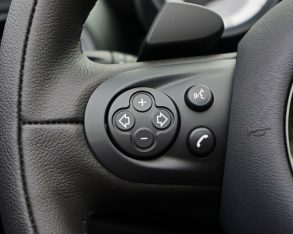 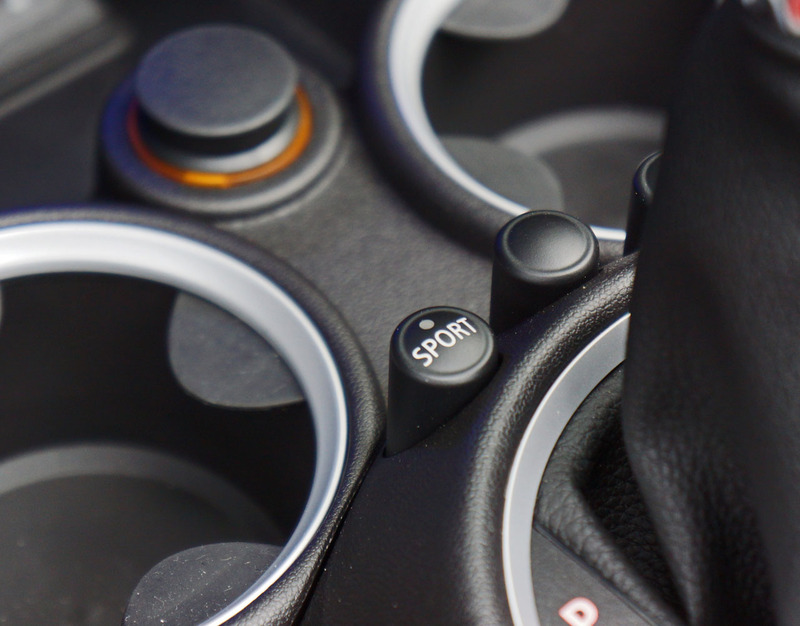 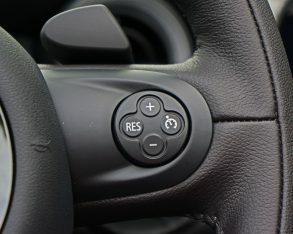 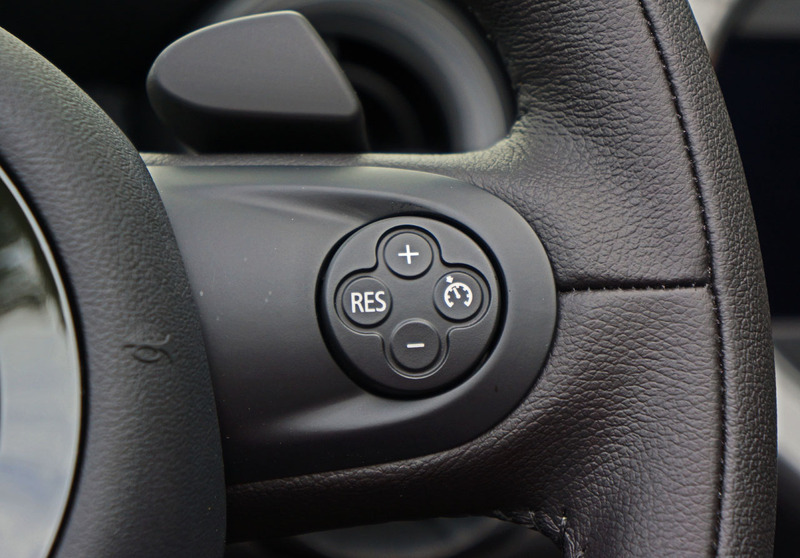 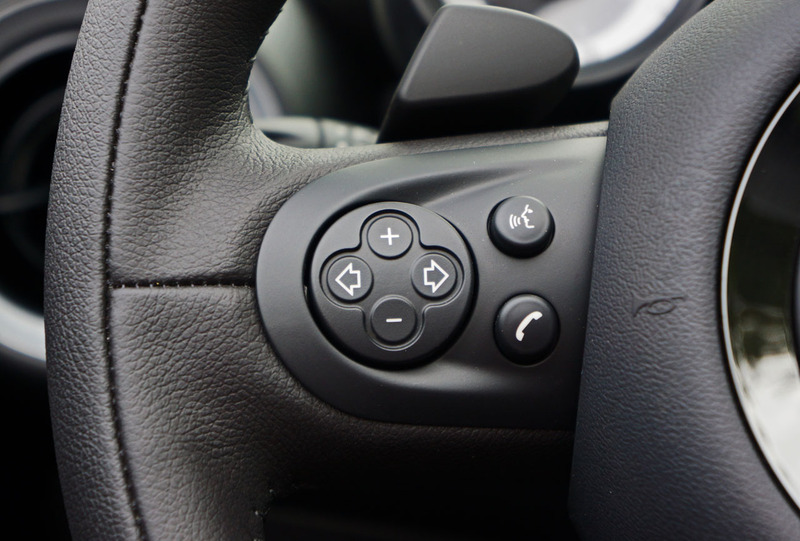 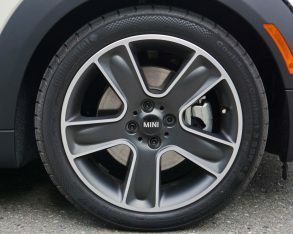 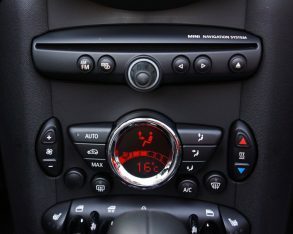 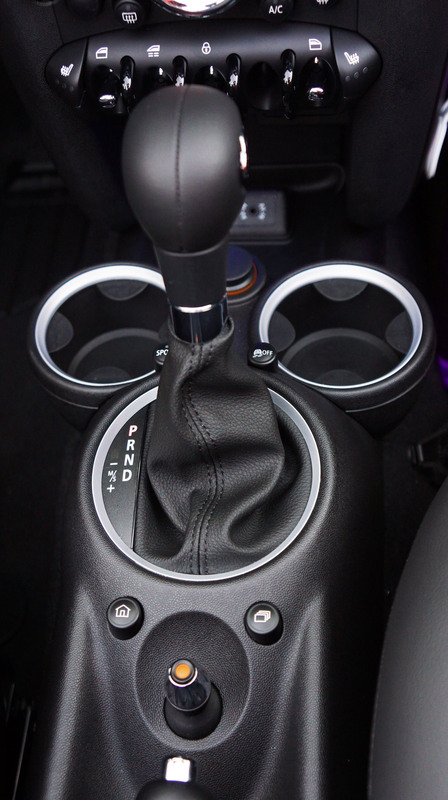 driver involvement that Mini’s manual delivers, but the autobox is extremely quick shifting in Sport mode, where I left it 90-percent of the time, and its steering wheel-mounted paddles are thoroughly engaging when hard-charging through corners. 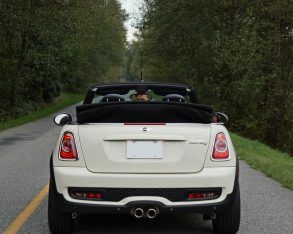 I took opportunity to do just that in the pastoral area where my partner and I went to shoot photos. 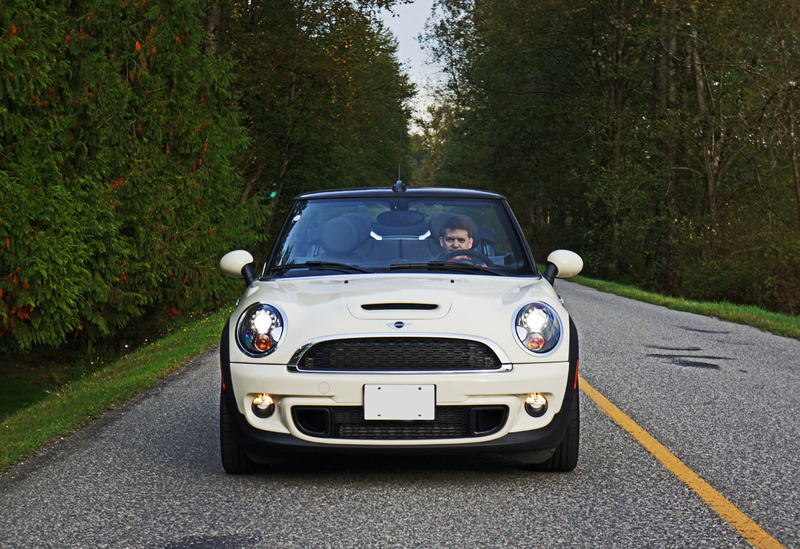 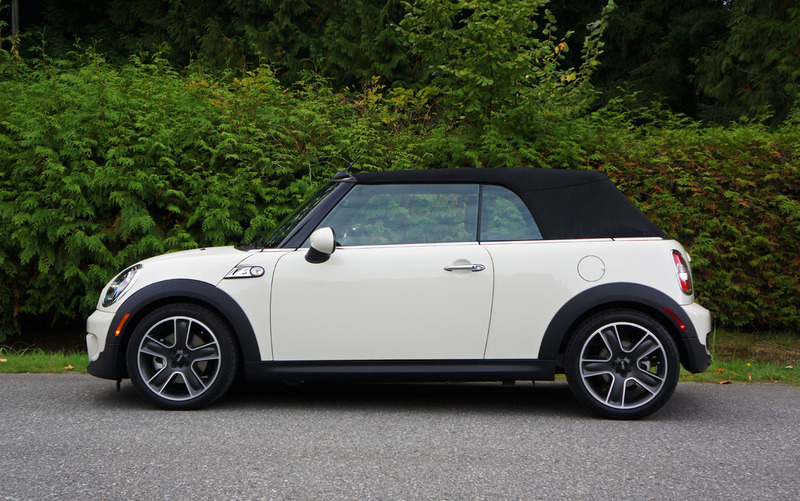 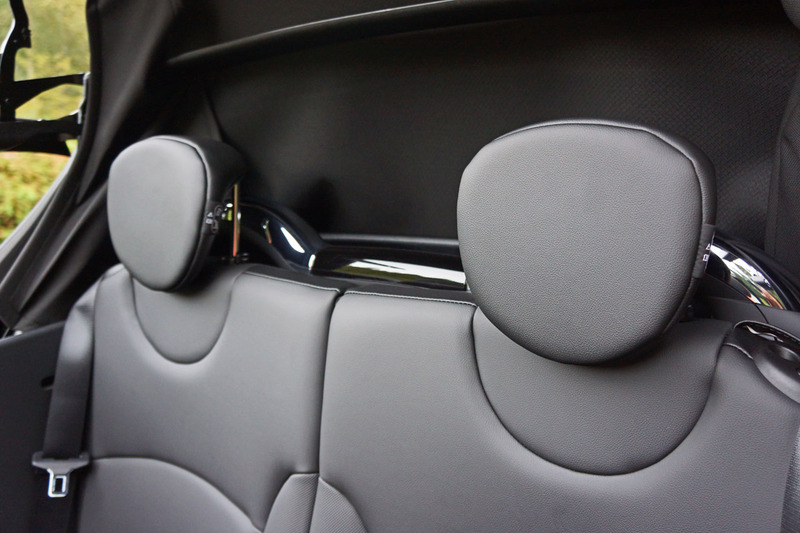 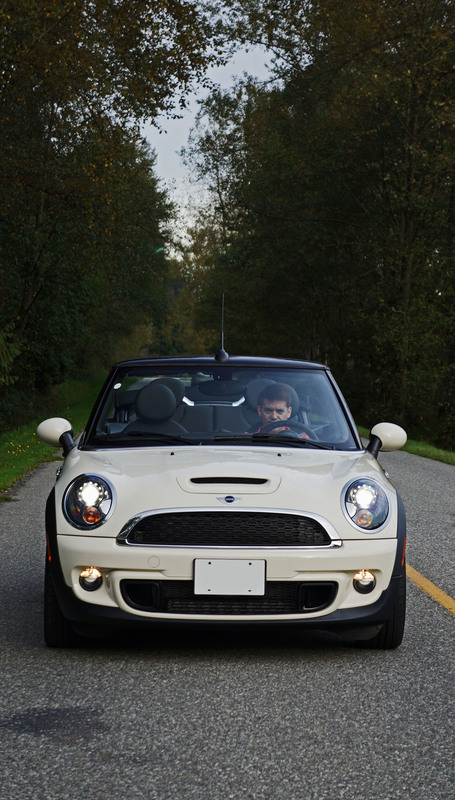 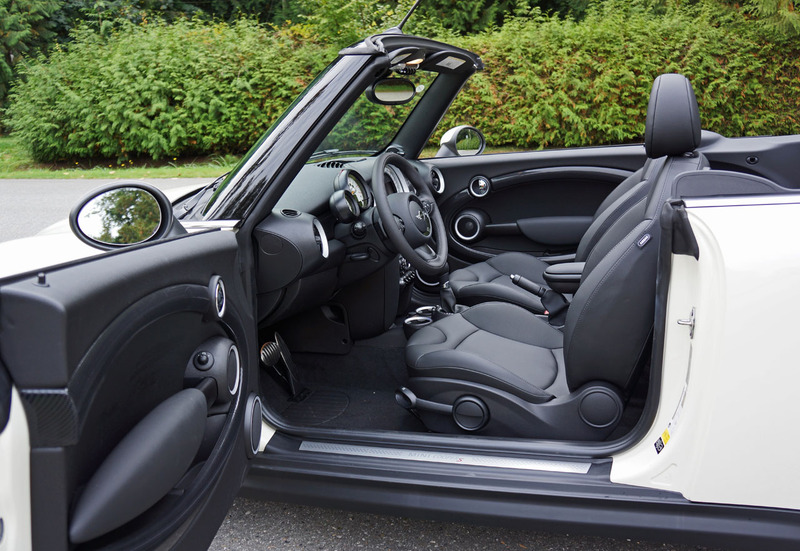 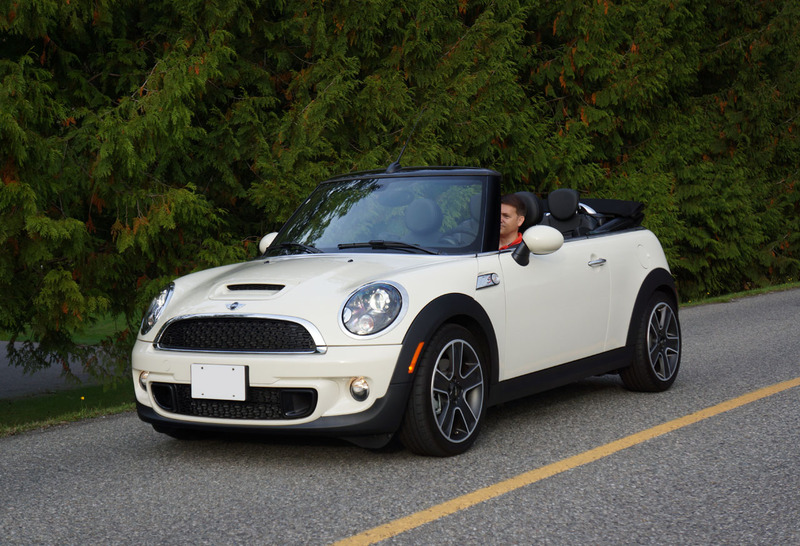 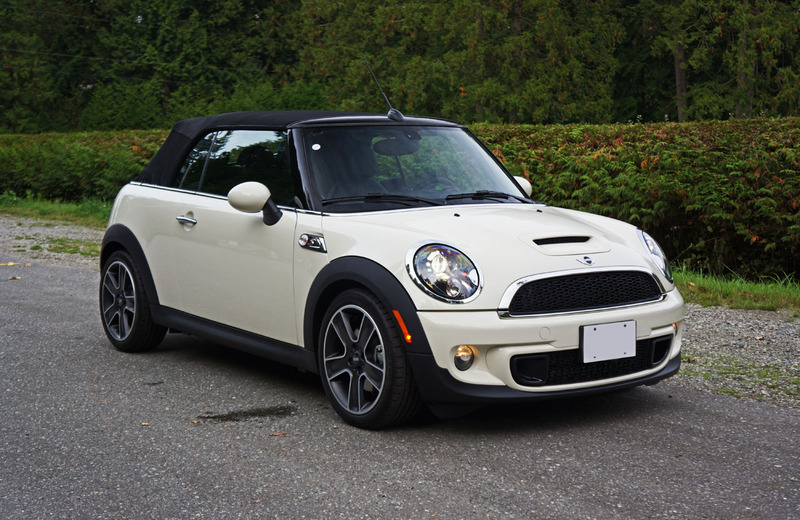 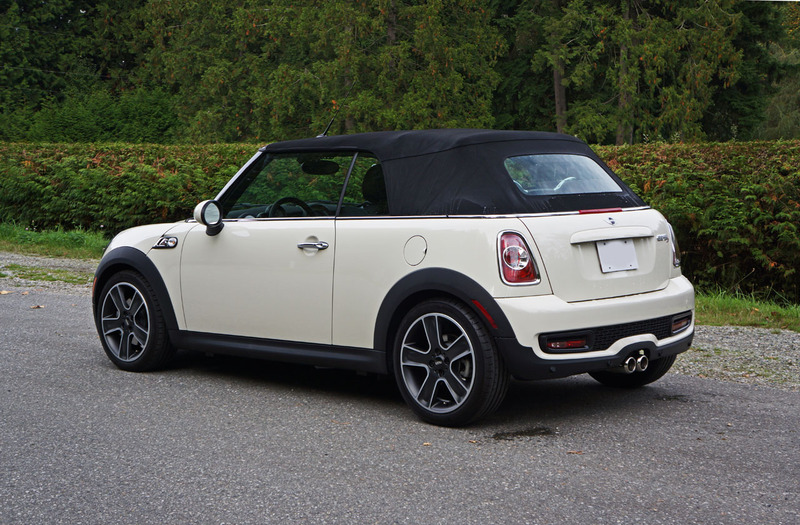 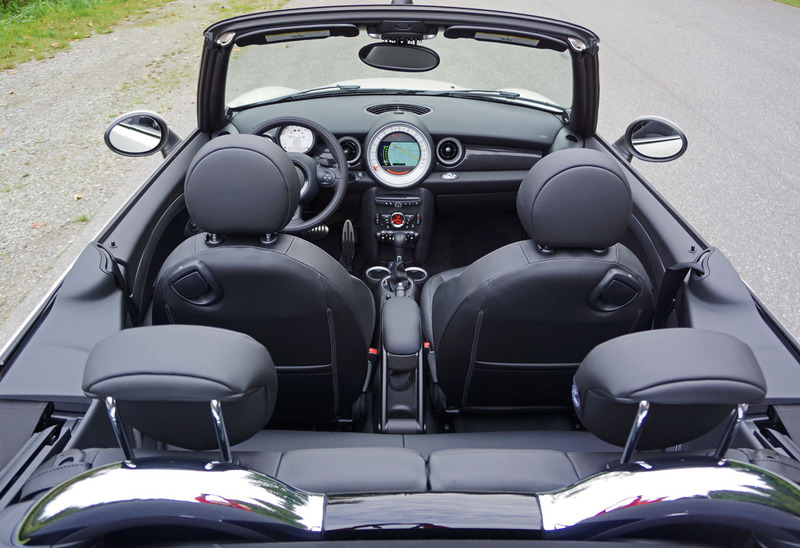 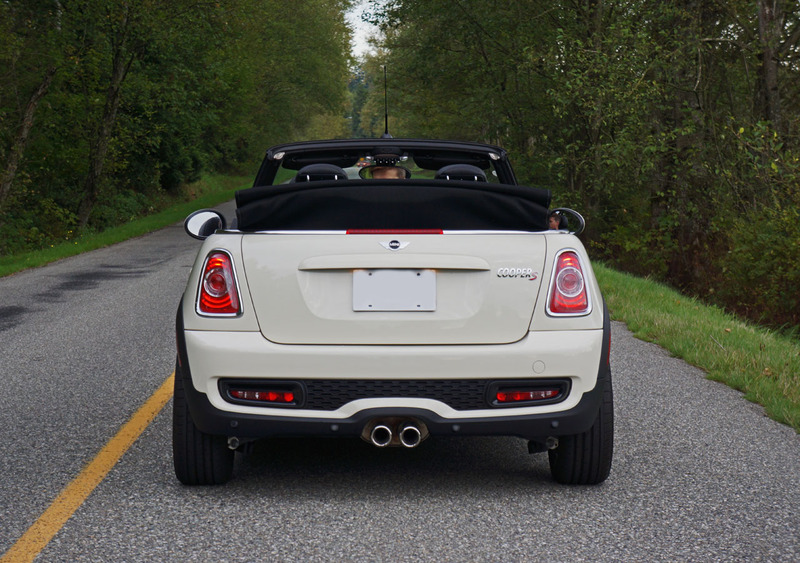 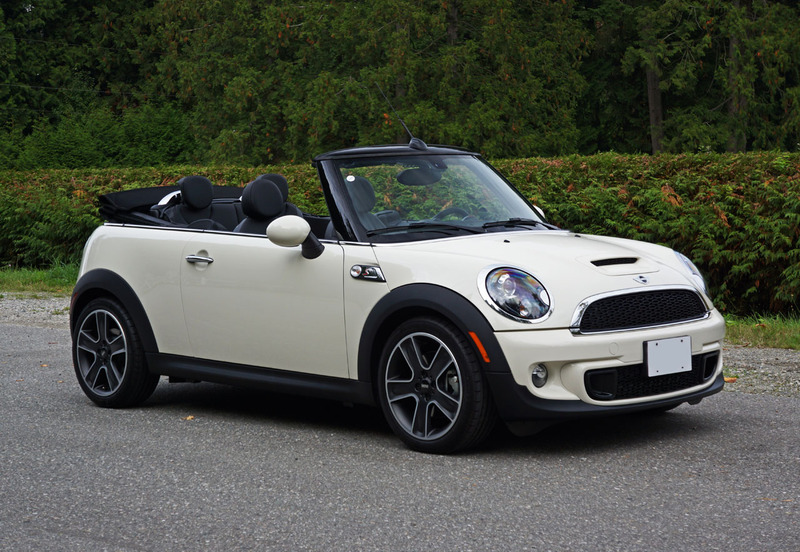 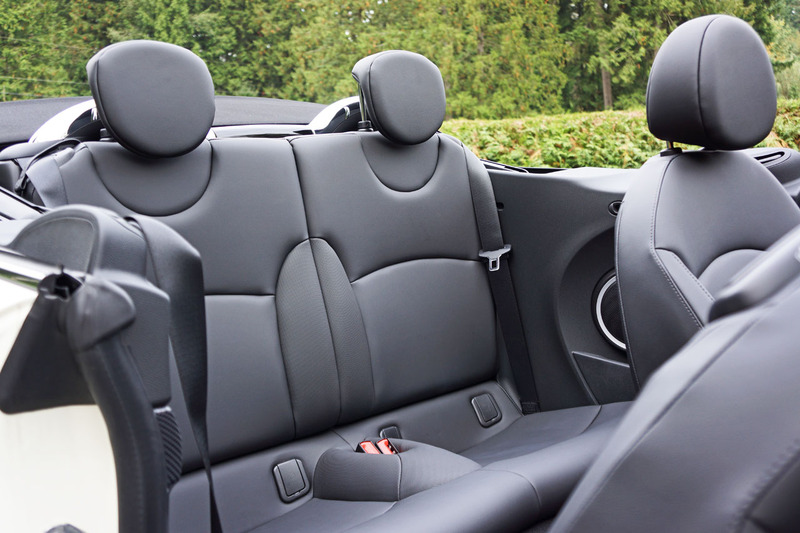 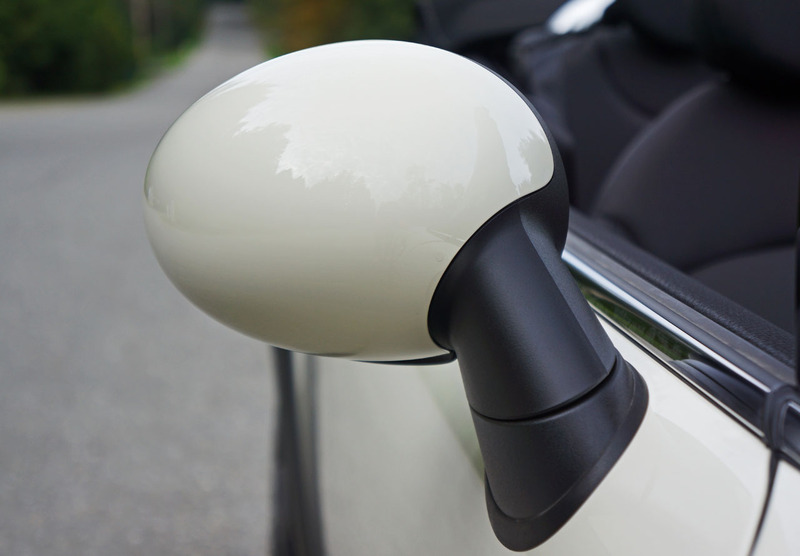 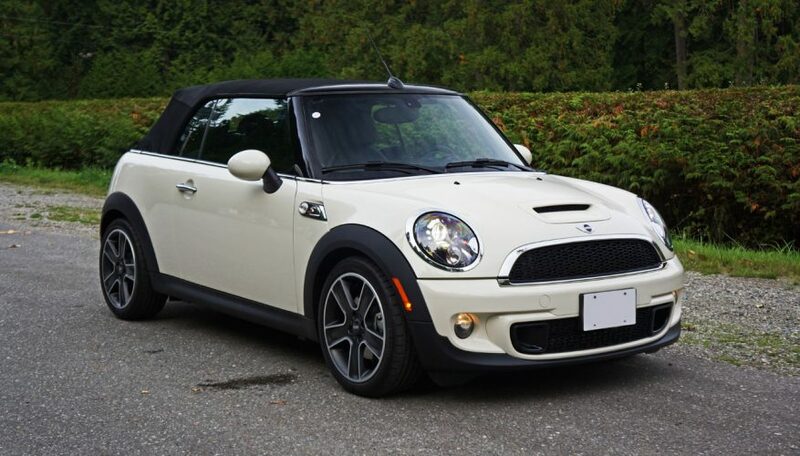 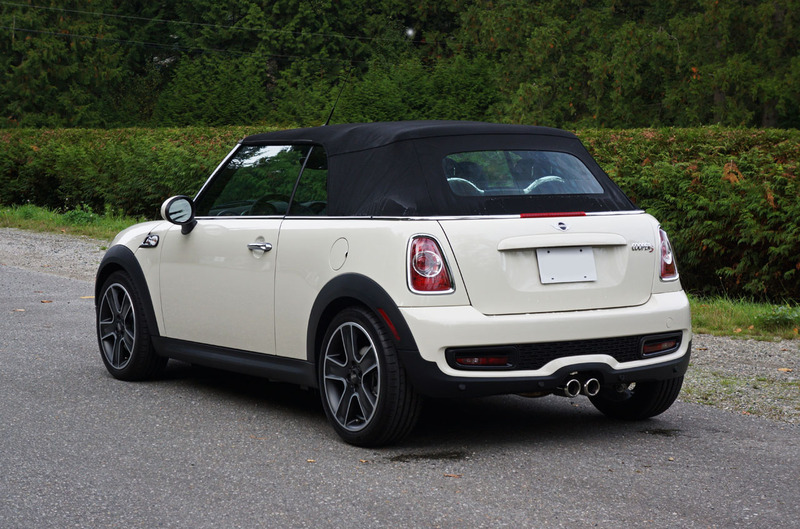 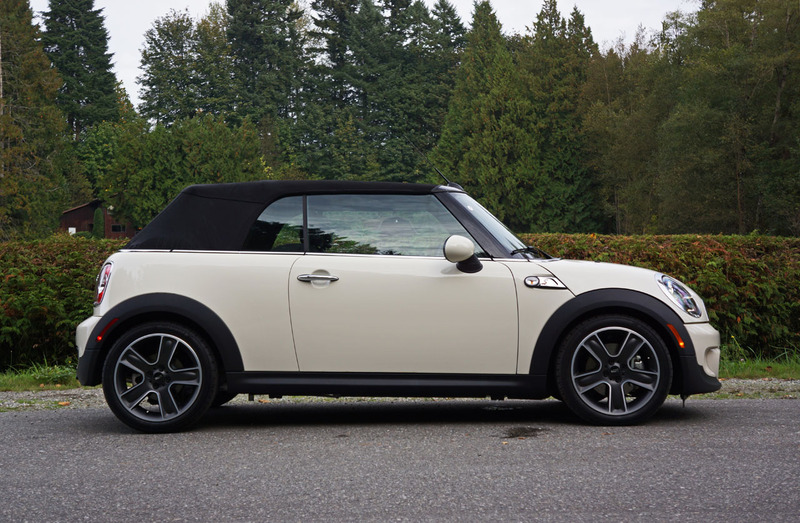 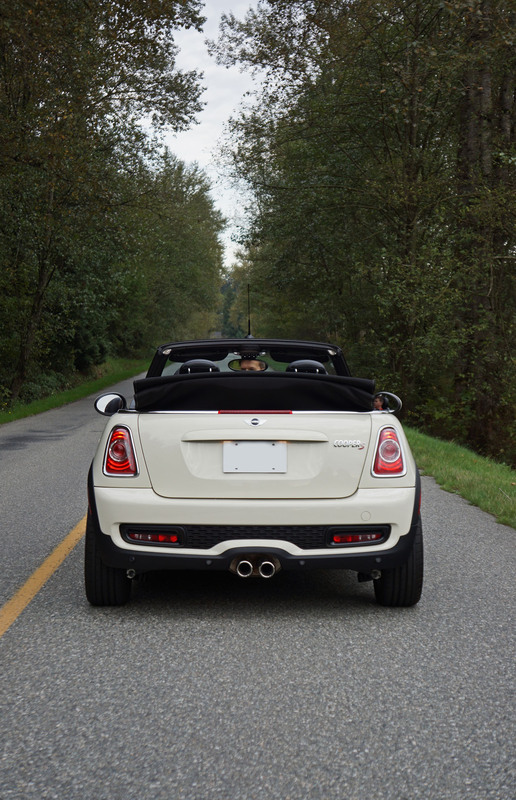 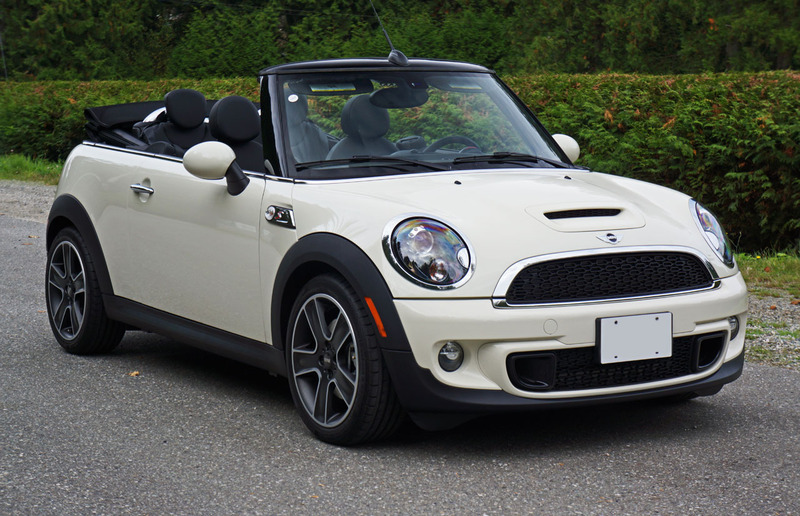 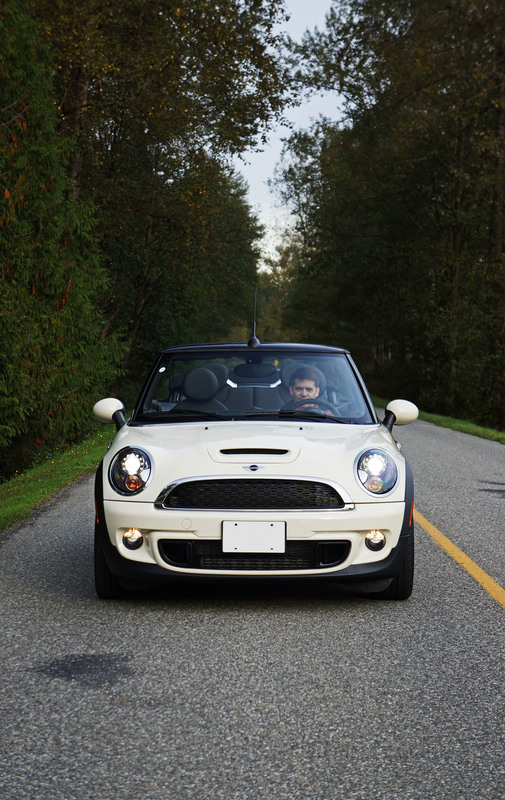 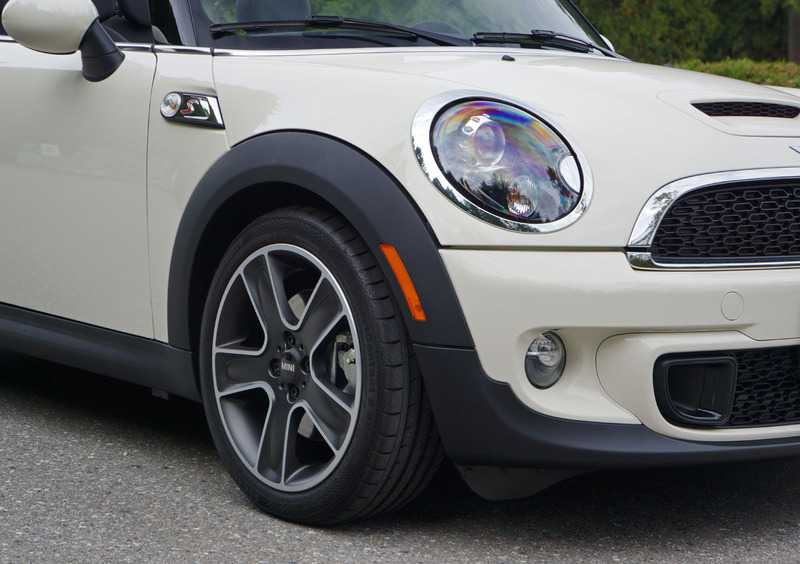 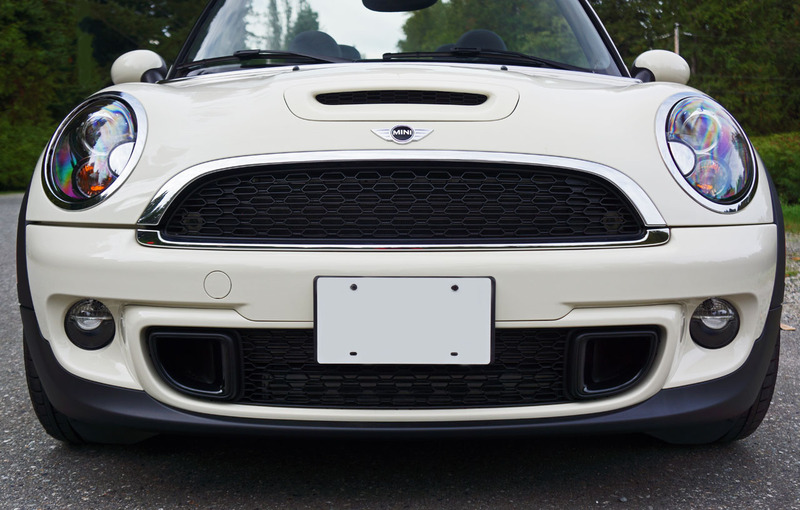 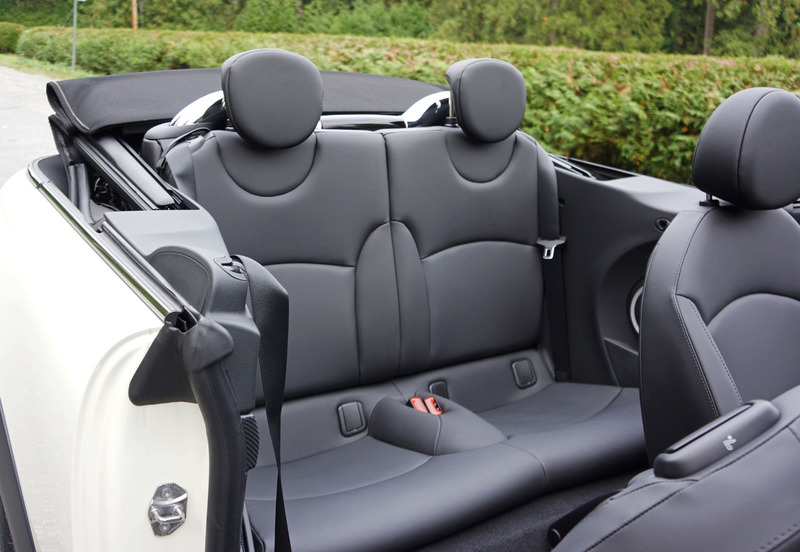 She always enjoys going quickly in a capable car, and the ease that a Mini Cooper S Convertible takes to curves will make anyone feel safe and secure. 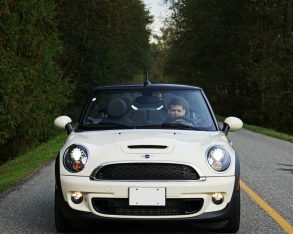 We wound our way through the beautiful countryside, only a trace of fall colours showing on the few deciduous trees scattered between myriad evergreens, the formers’ leaves still holding fast yet trying their best to match the golden yellow of the twisting lane divider on the inky black stretches of pavement ahead, below and behind. 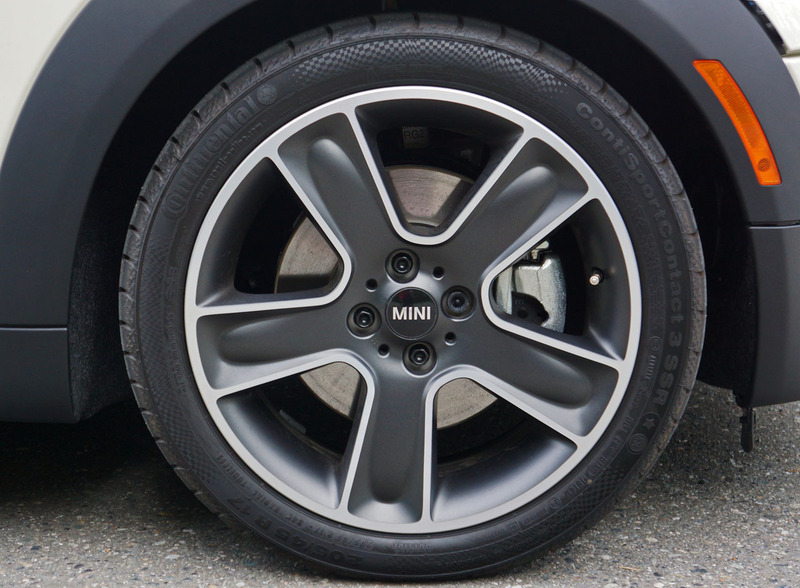 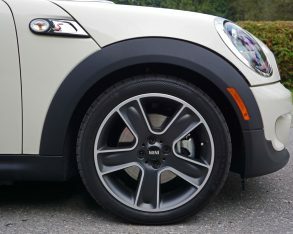 car’s 205/45R17 runflats, while smallish on some vehicles are large for a subcompact (the base Cooper S Convertible is shod in 195/55R16s), and they held their line perfectly, never squirming or making a squealing fuss underfoot and thankfully never veering from our single lane. 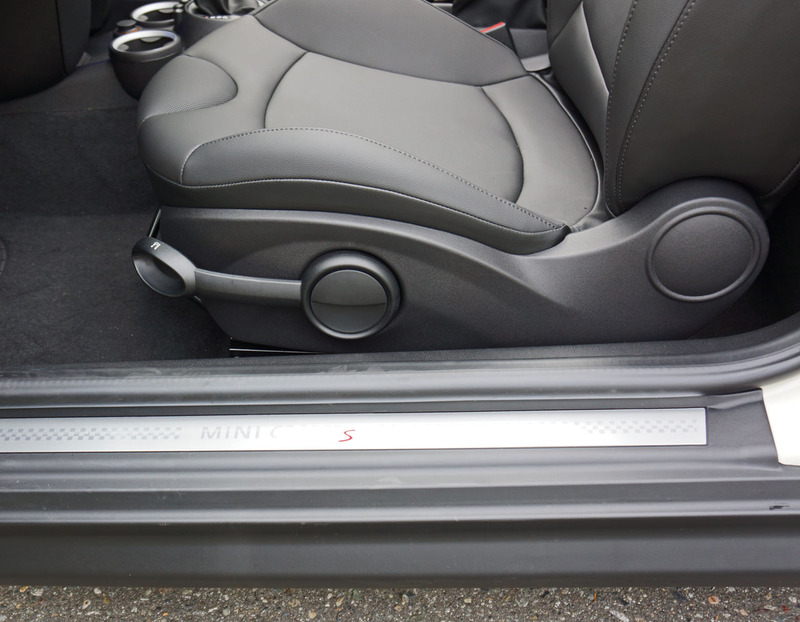 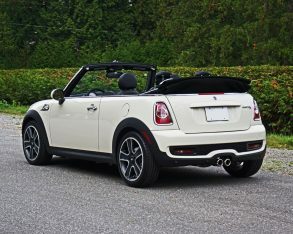 The Cooper S Convertible’s front strut and rear multi-link suspension setup keeps the car seemingly locked to the road, yet provides a ride that’s much more comfortable than you’d probably expect. 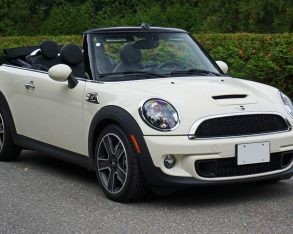 than the base model respectively. 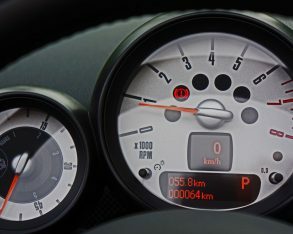 Top speed also benefits, up 29 km/h to 220 with the auto and showing a 27-km/h improvement to 225 km/h with the manual-equipped car. 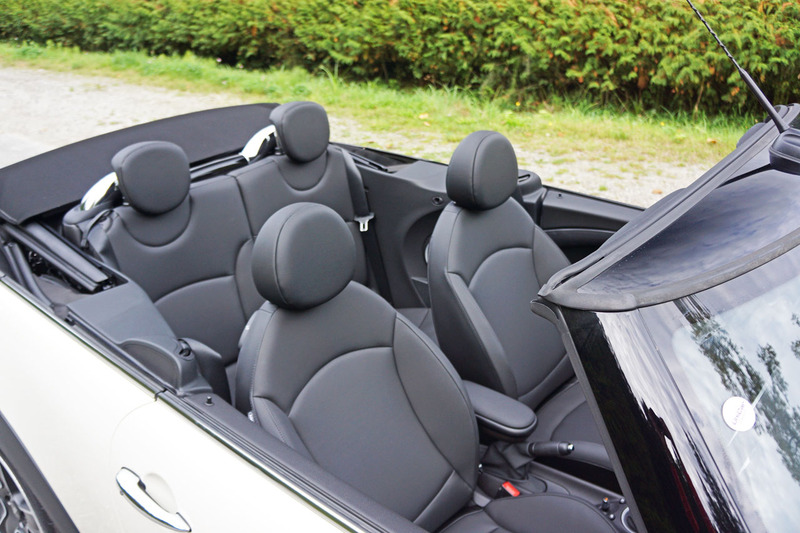 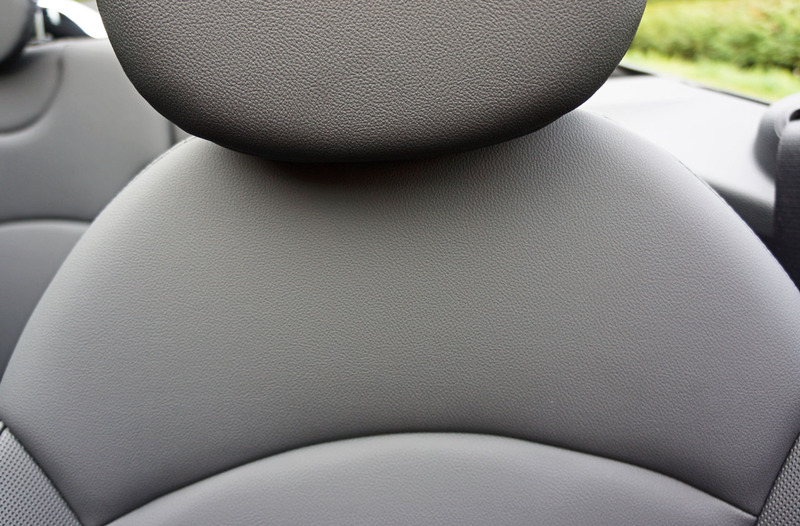 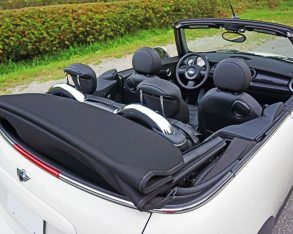 The Cooper S Convertible’s abbreviated 2,467-mm wheelbase means that cowl shake and structural shimmies won’t occur at all, such issues left to less rigid longer wheelbase drop-tops. 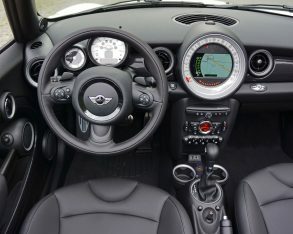 Mini’s ragtop is tight like a little drum, critically important for its raison d’etre, which of course is weaving through serpentine ribbons of tarmac with unbridled enthusiasm. 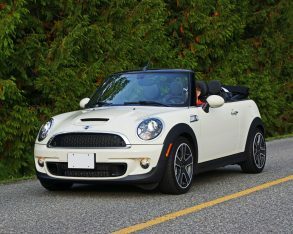 As you’ll already know if you’ve read my Mini Cooper Convertible review, I gave the Cooper S Convertible a fun factor of nine out of 10 (the base Cooper Convertible got an eight and JCW received full marks with a 10), as it leaves a grin on your face even when filling up at the pump. 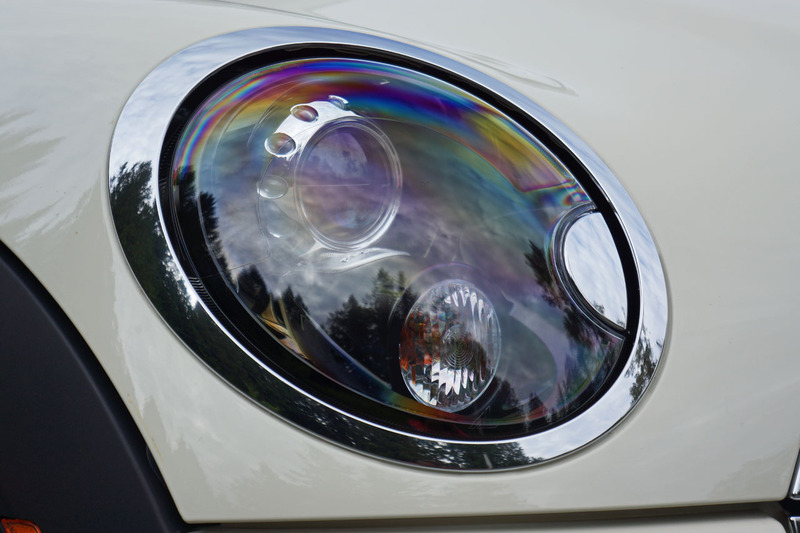 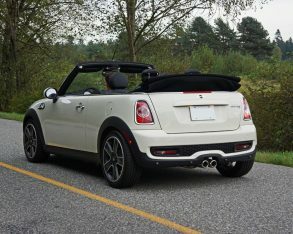 fuel economy is another Cooper S Convertible benefit. 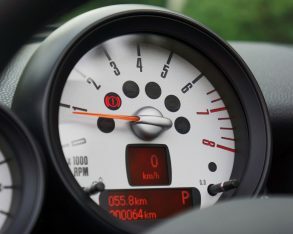 Despite its much greater performance, when it’s time to refill the S-badged car’s 50-litre tank your wallet won’t get dinged much more than the base model thanks to a claimed rating of 7.7 L/100km city, 5.6 highway and 6.8 combined with the manual or 7.9, 5.8 and 7.0 with the automatic, compared to the base Cooper Convertible’s estimated rating of 7.4 city, 5.7 highway and 6.6 combined for the manual and 7.6, 5.6 and 6.7 with the auto. 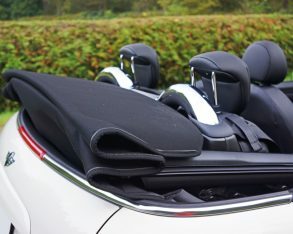 Both models will make you rethink your priorities when it comes to baggage, however, as there’s only 170 litres of cargo space in the tiny trunk. 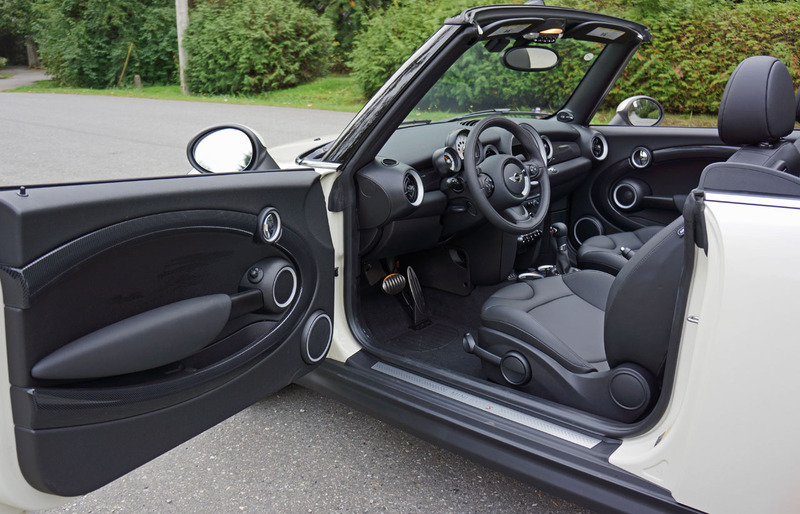 But three’s a crowd anyway, right? 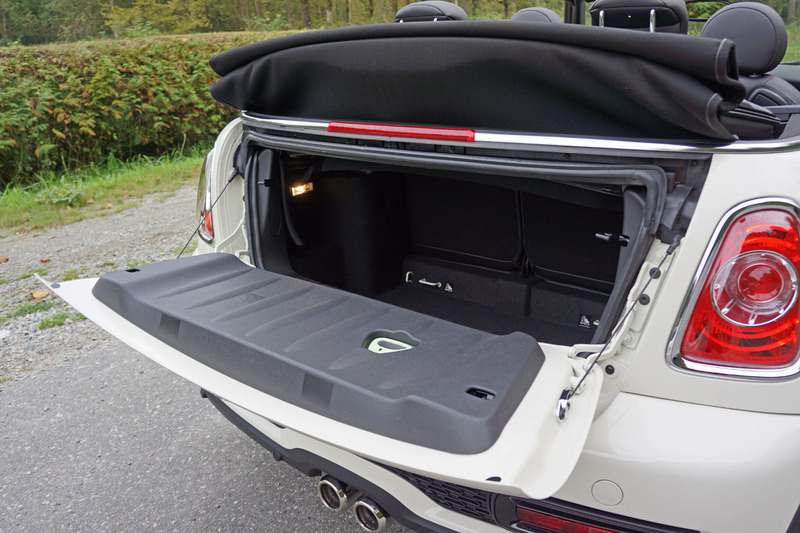 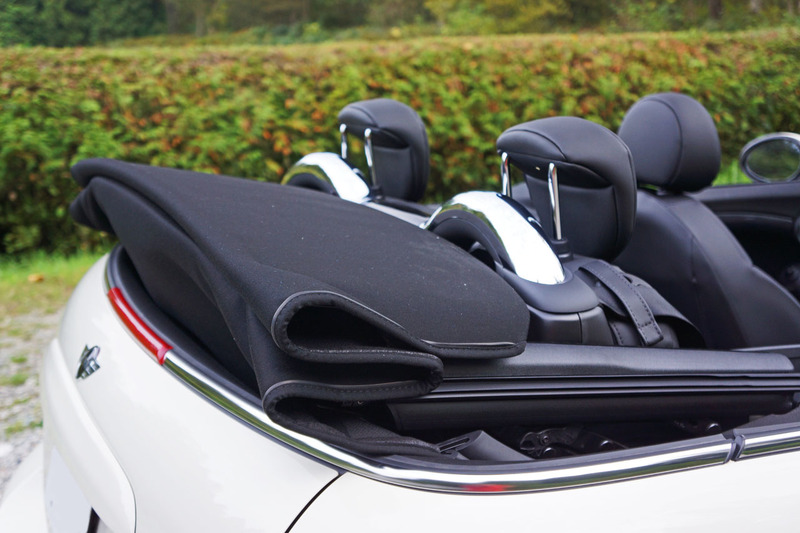 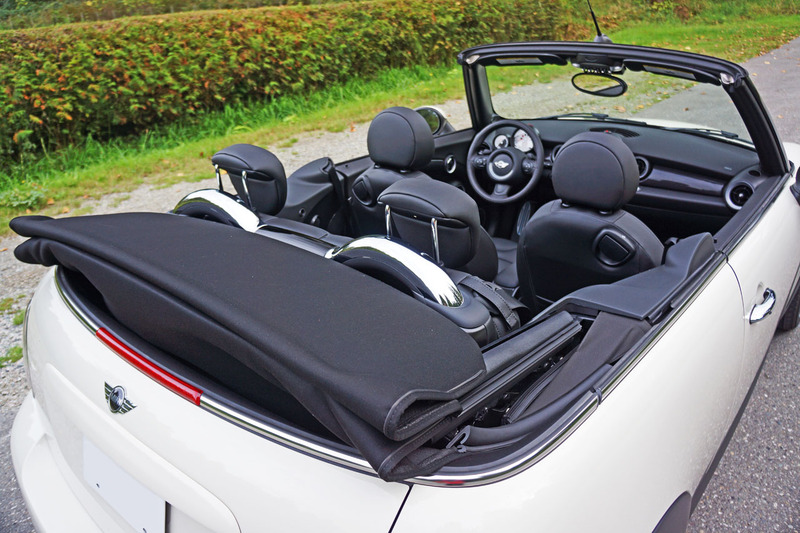 Lay the 50/50 split-folding rear seats flat and all of a sudden you and your significant other will have 660 litres of gear-toting space at your disposal, which is more than ample for a weekend (or weeklong) getaway. 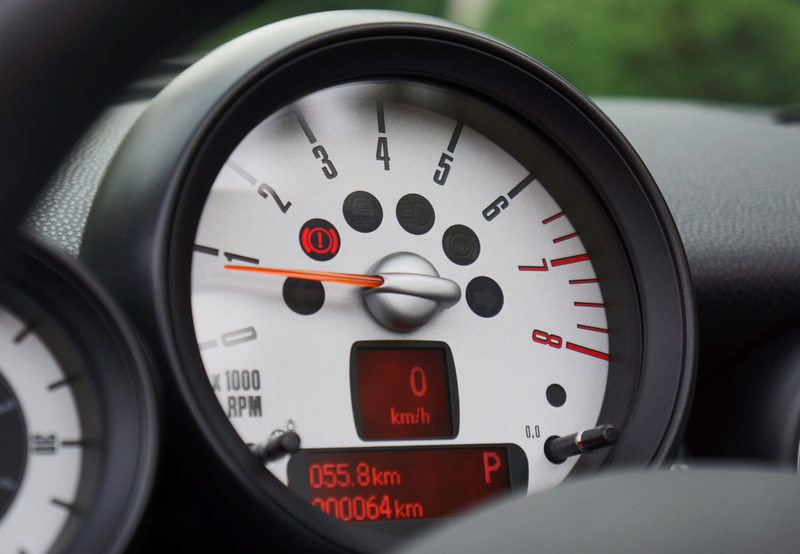 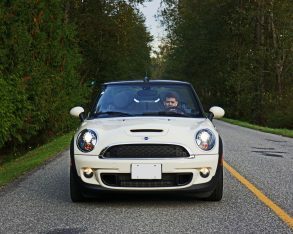 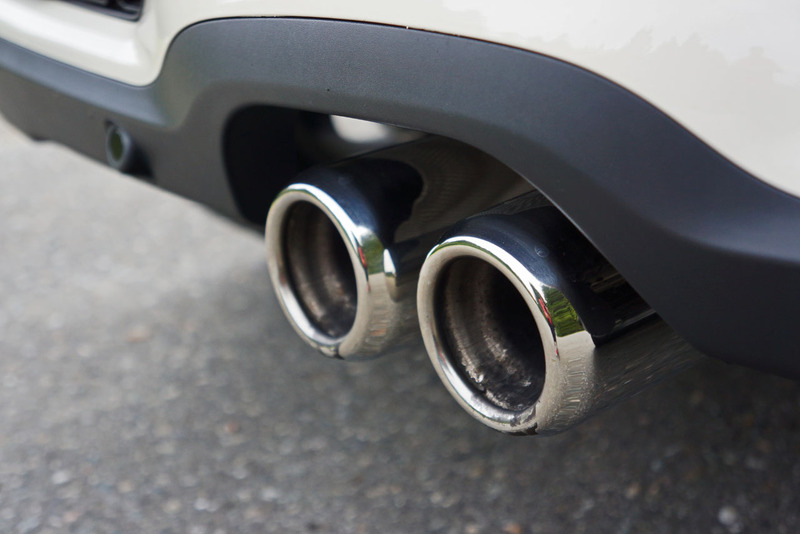 in a Mini can be a very rewarding experience, and I’m not just talking about how much fun you’ll have on aforementioned country backroads or like I just mentioned, saving on gas. 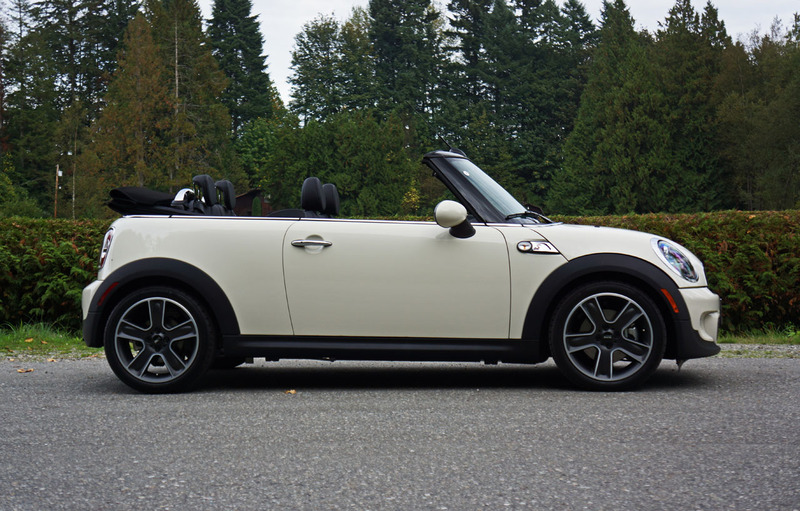 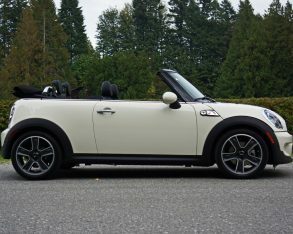 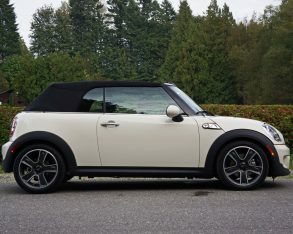 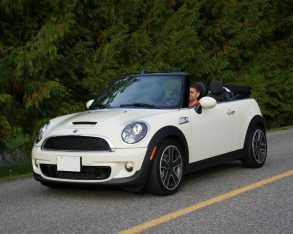 Rather, all Minis are nicely equipped cars and my Cooper S Convertible tester was downright plush. 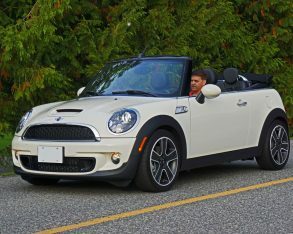 Even the base Cooper Convertible, which starts at $29,500 plus $2,295 for freight and pre-delivery prep, comes with pushbutton ignition, a multi-function tilt and telescopic steering wheel, power windows with one-touch up/down all-round, automatic climate control, USB connectivity and Bluetooth hands-free, an on-board computer, multi-colour ambient lighting, plus a whole slew of other items expected in Mini’s near-luxury class, not to mention a powered fabric roof with truly useful sunroof capability that allows the front portion of the roof to be left open at speeds up to 120 km/h. 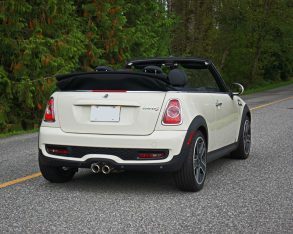 Cooper S Convertible adds some additional kit to make that trip (and day-to-day life) all the more enjoyable, such as automatic headlamps, an auto-dimming rearview mirror, more comfortable and supportive front sport seats with heated cushions, plus rear parking sonar, while a number of options and packages can be added to keep the love affair flaming long after the honeymoon is over. 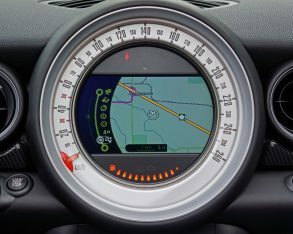 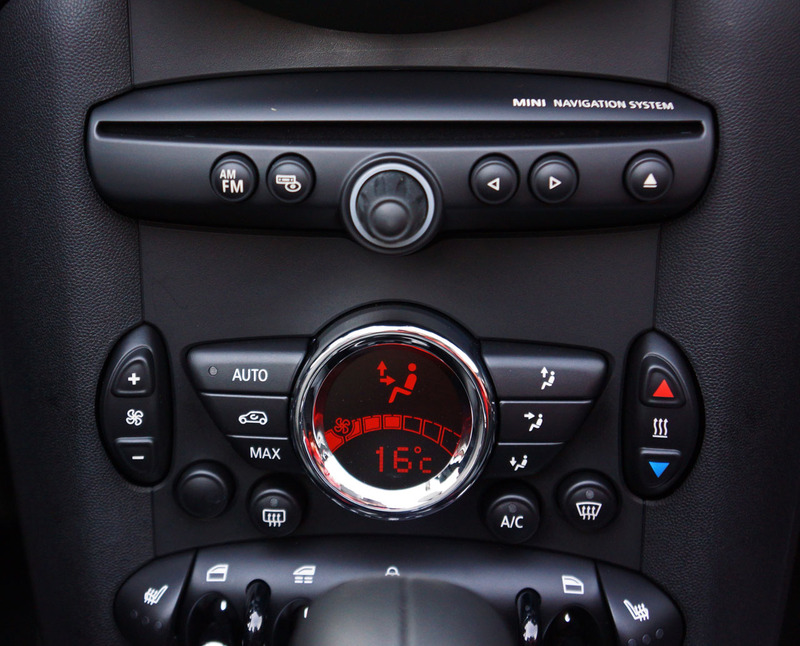 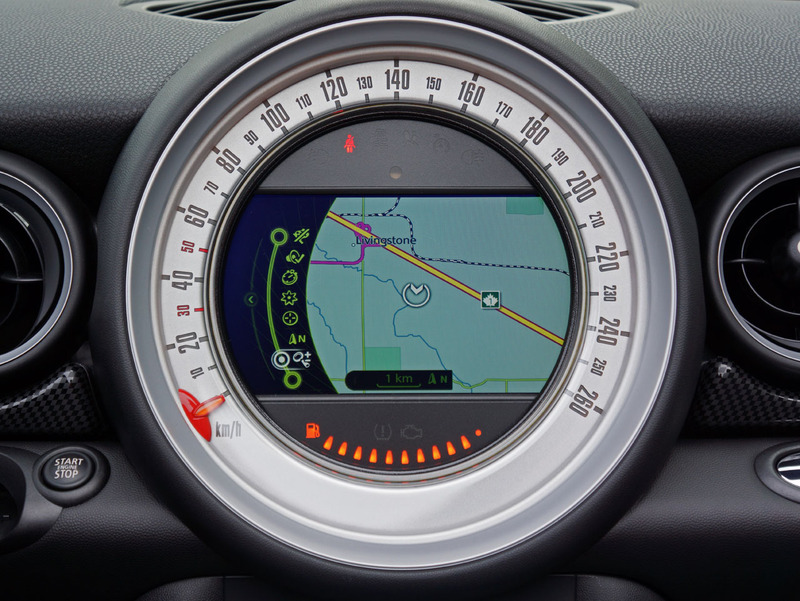 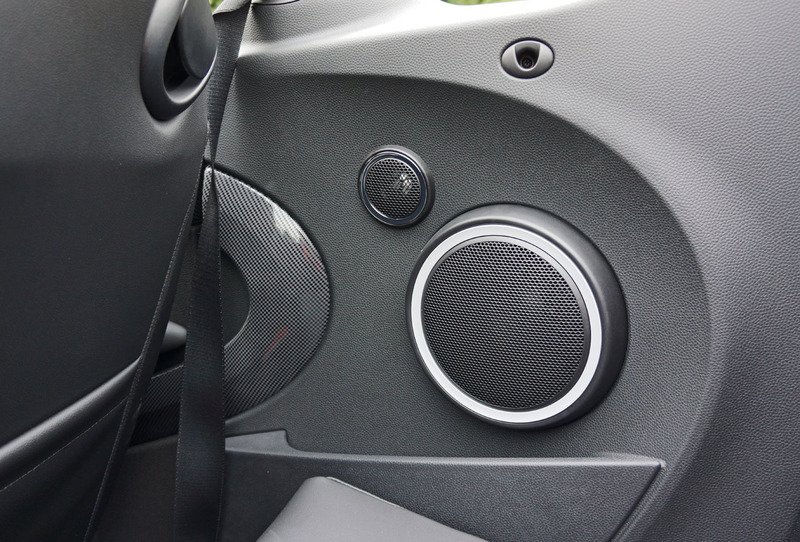 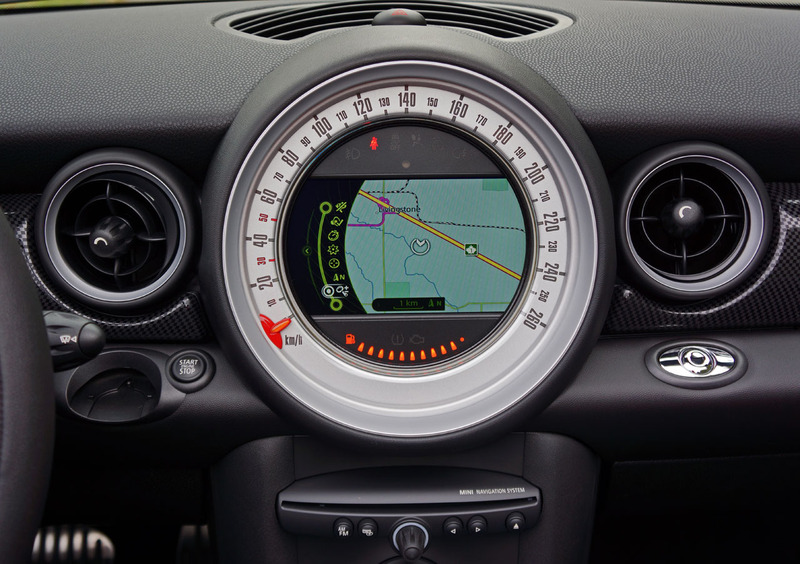 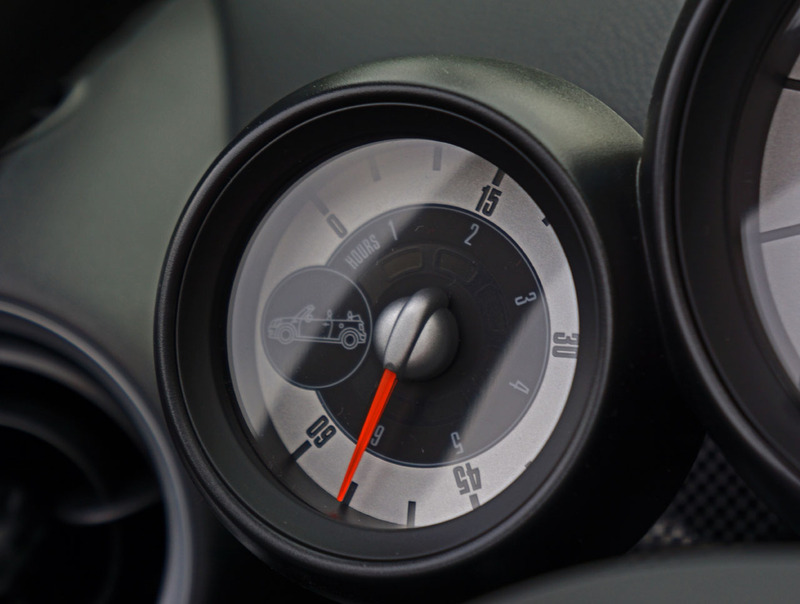 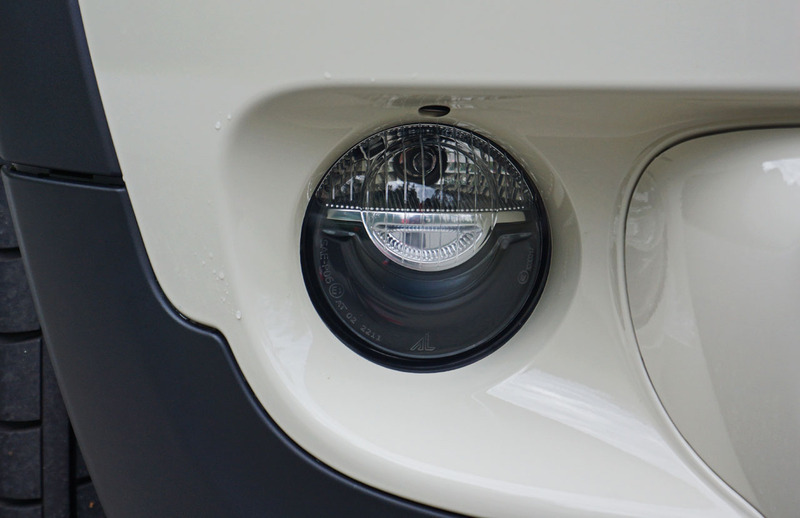 the big circular central speedometer pod, the needle of which circles around the outside of the infotainment display for a visual that will wow your friends and family. 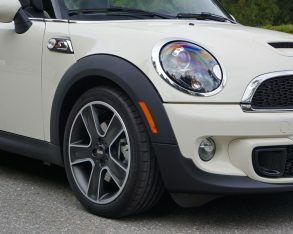 suspension I mentioned earlier, plus dynamic traction control and white side marker lights. 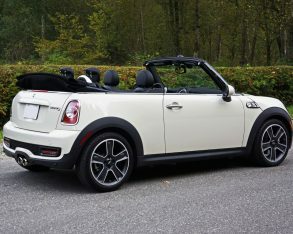 All of these options added $6,830 to the Cooper S Convertible’s $34,150 base MSRP, for a total equaling $42,980 before tacking on the $2,295 needed for freight and dealer prep. 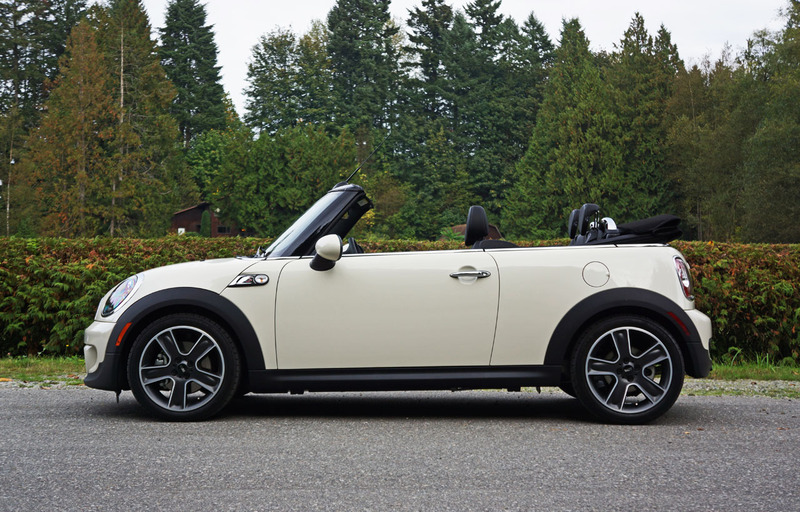 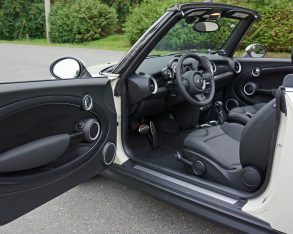 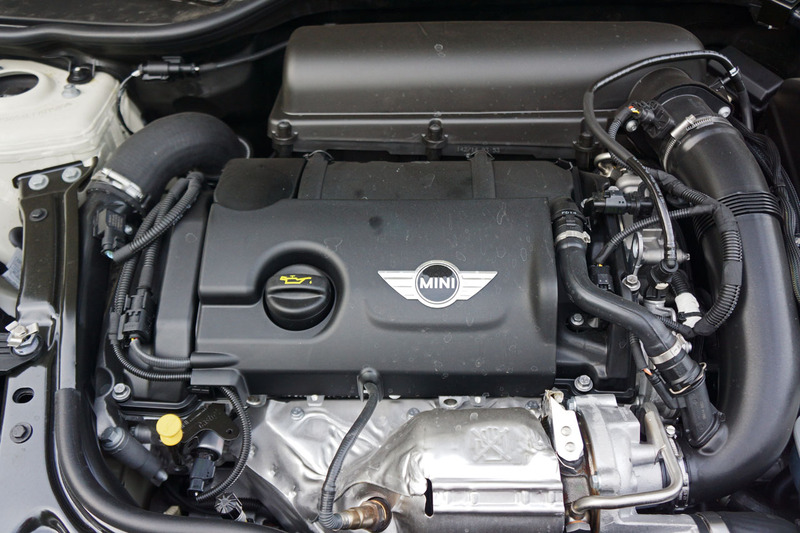 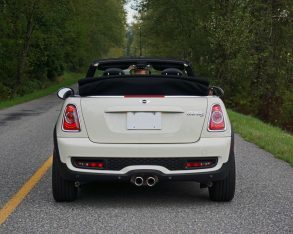 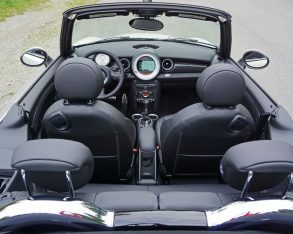 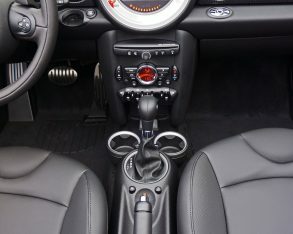 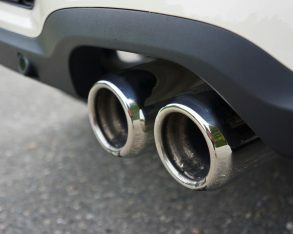 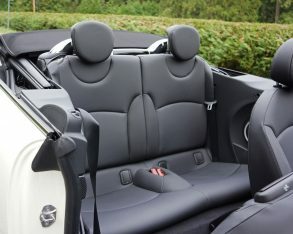 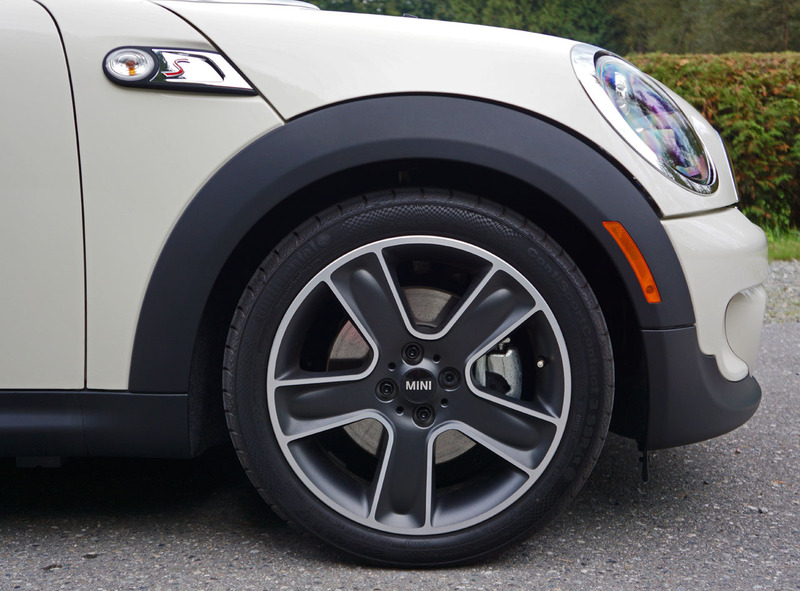 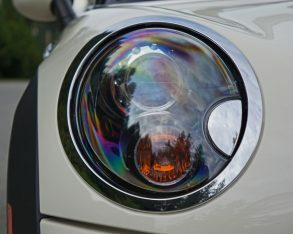 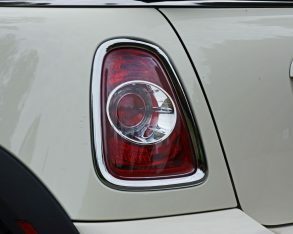 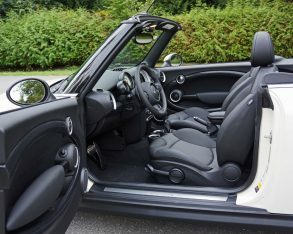 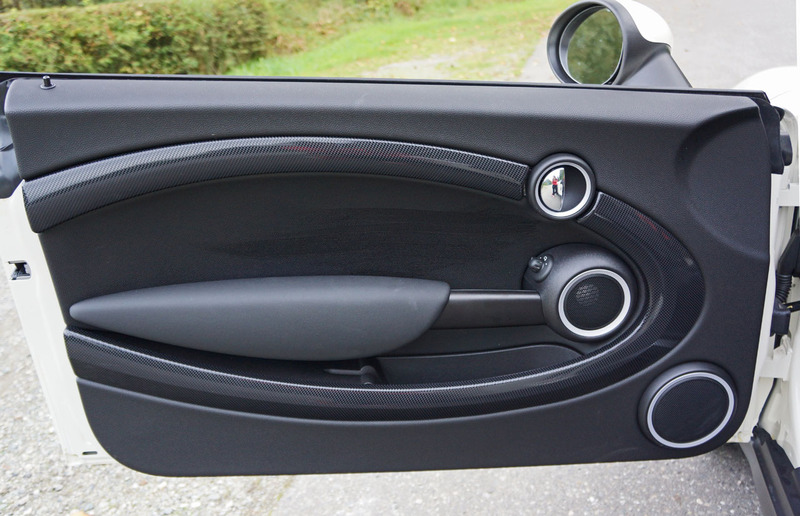 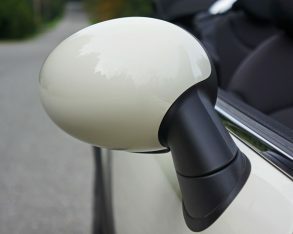 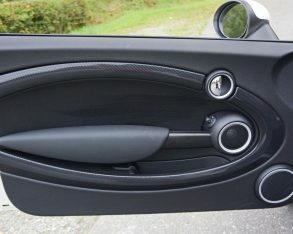 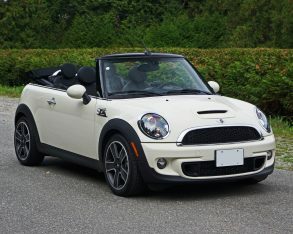 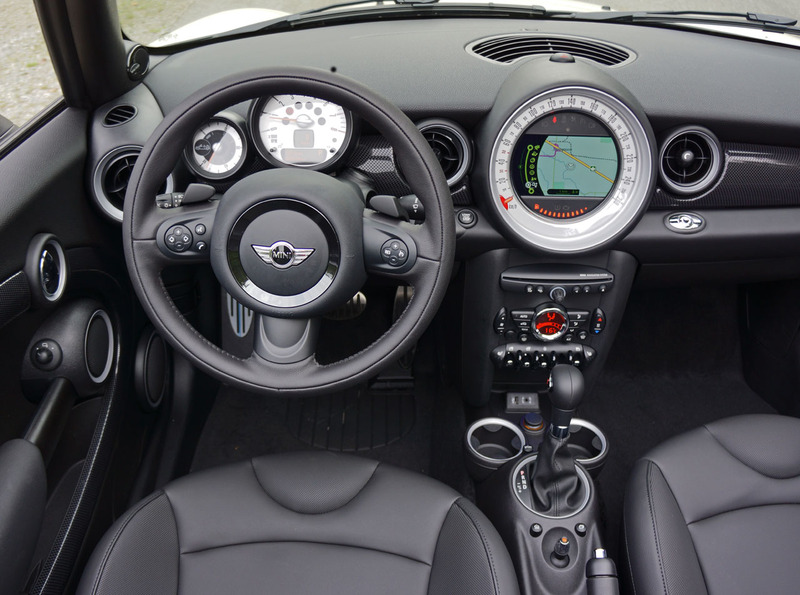 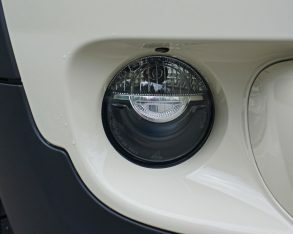 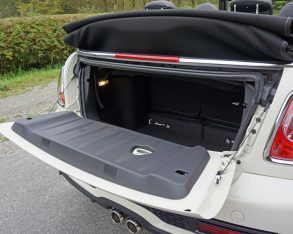 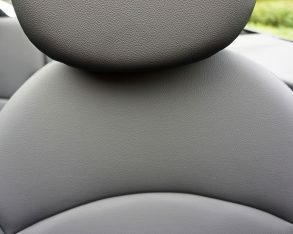 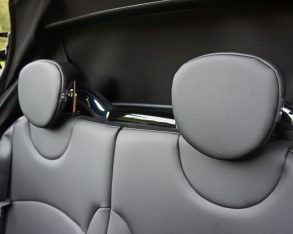 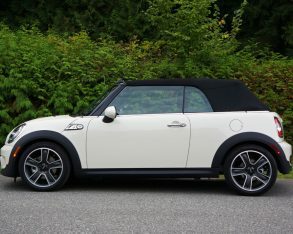 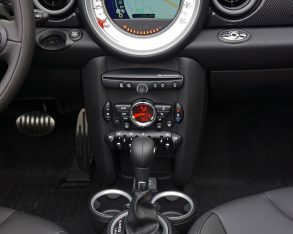 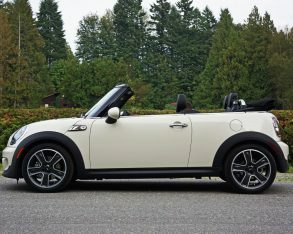 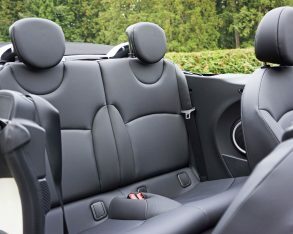 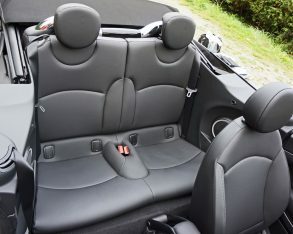 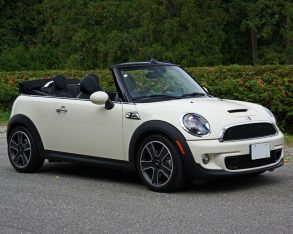 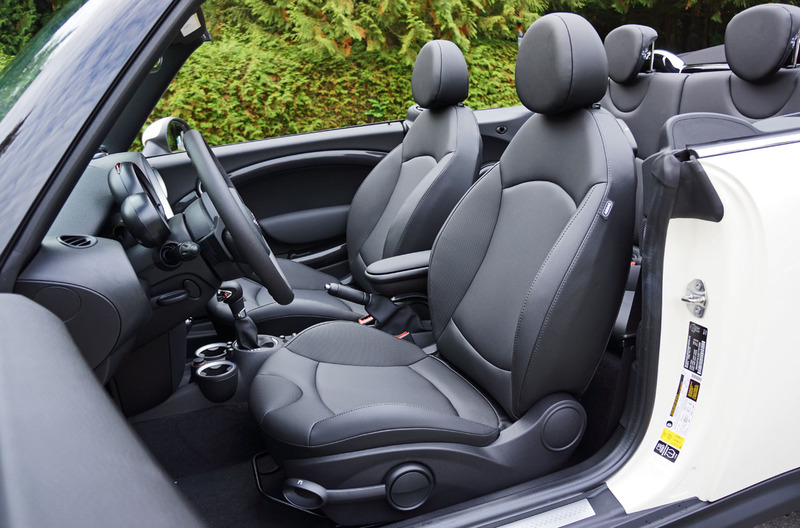 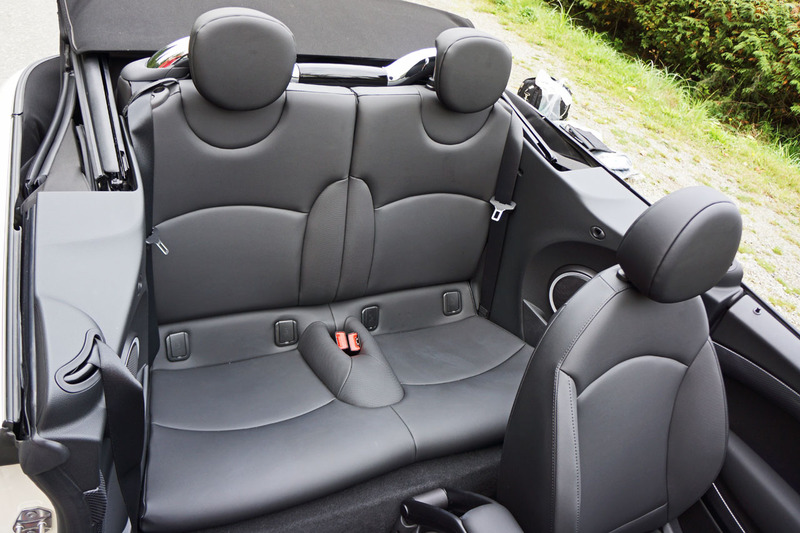 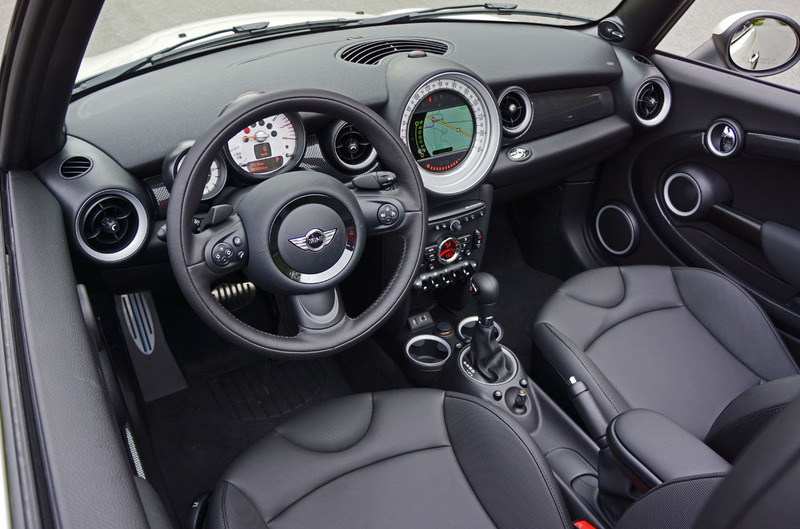 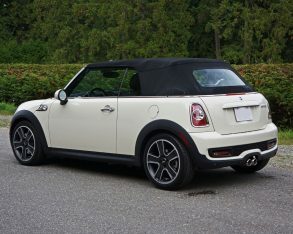 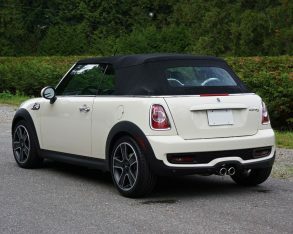 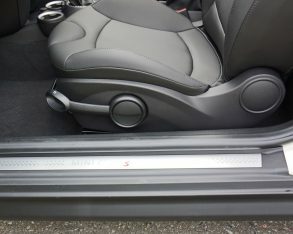 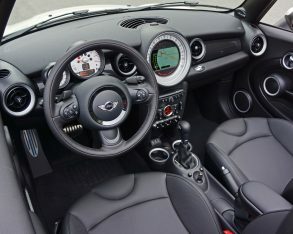 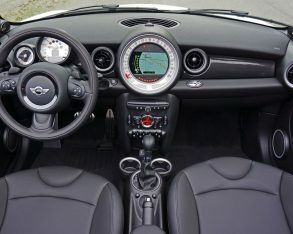 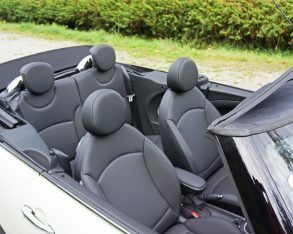 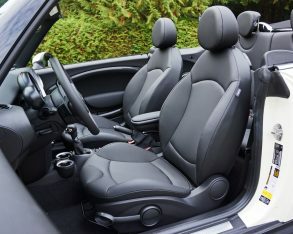 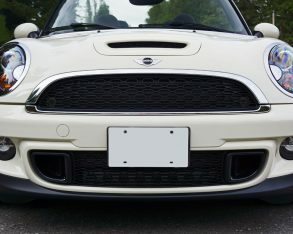 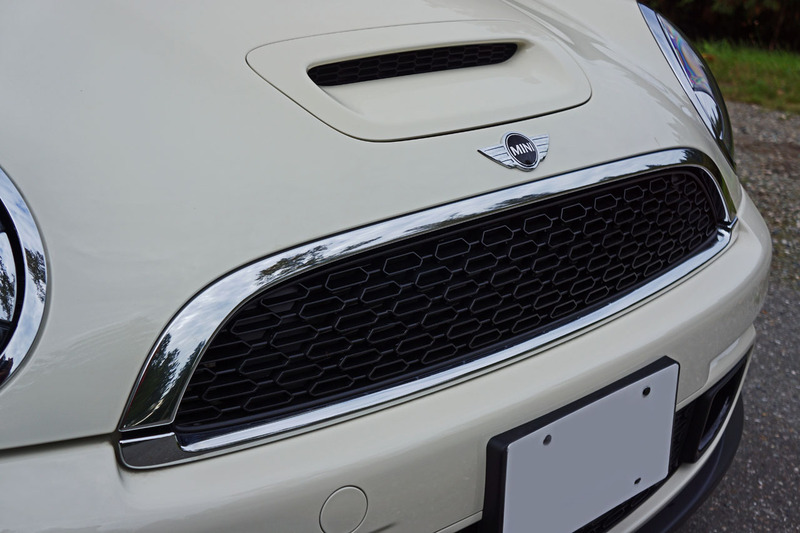 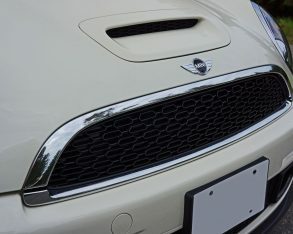 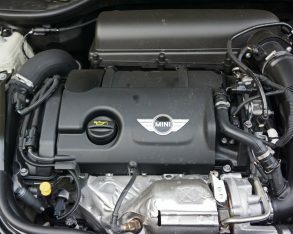 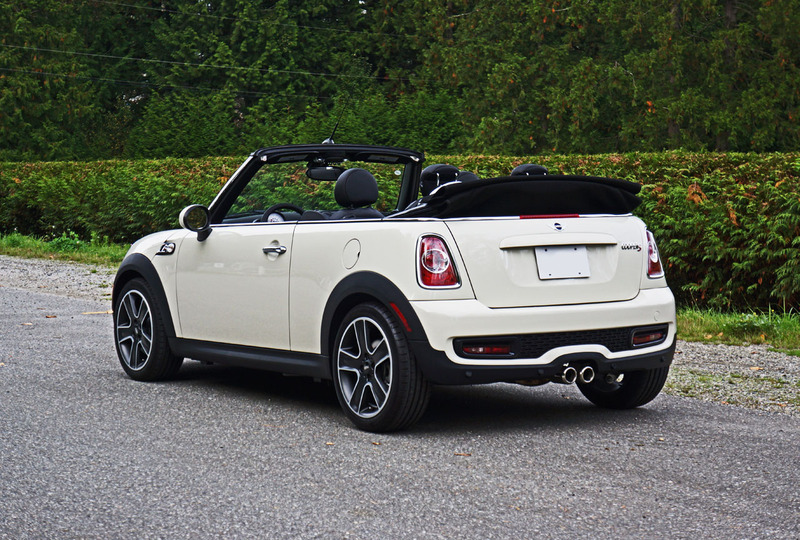 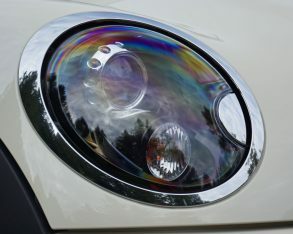 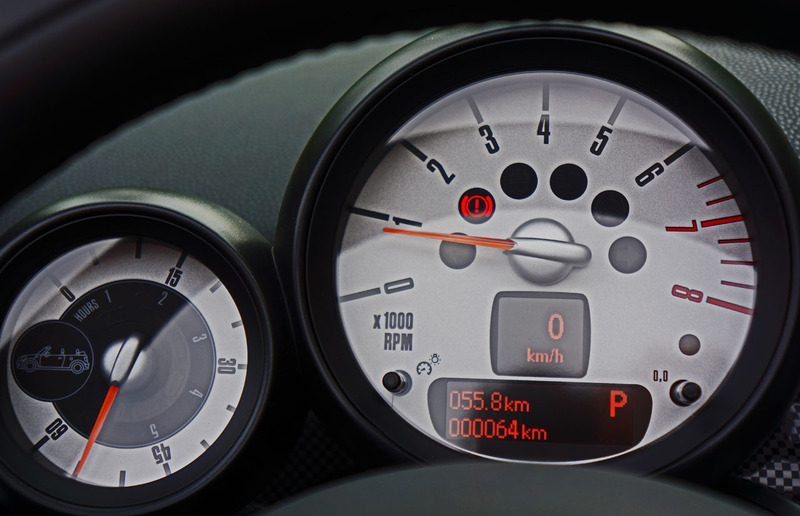 Additional packages are available, including one that will even dress your Cooper S Convertible in JCW duds, adding everything but the more powerful engine, or alternatively a Mini Yours package that replaces the Cooper S Convertible’s performance-first black on black look with classy light grey detailing inside and out. 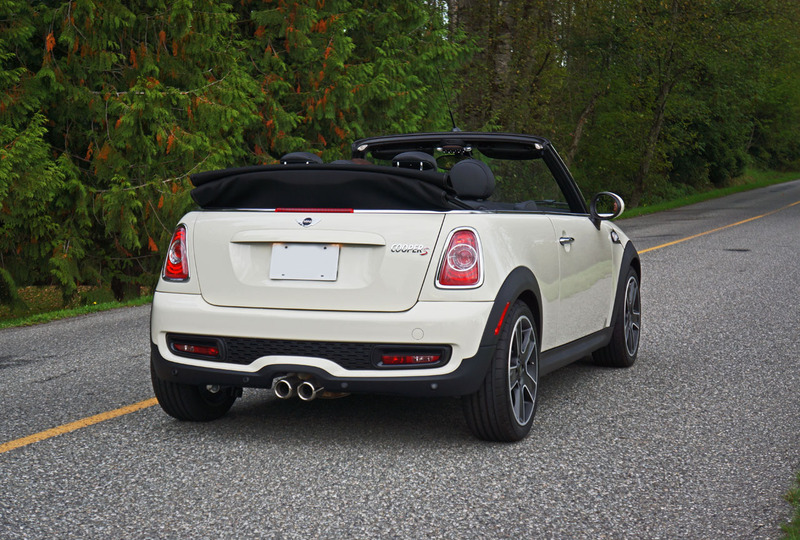 $40k-plus might sound like a significant price to pay for a subcompact ragtop, you need to factor in that a Mini Cooper S Convertible delivers the kind of performance-luxury experience expected from a premium brand, just in a smaller, thriftier and more entertaining package. 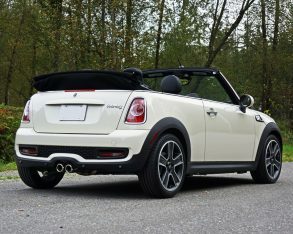 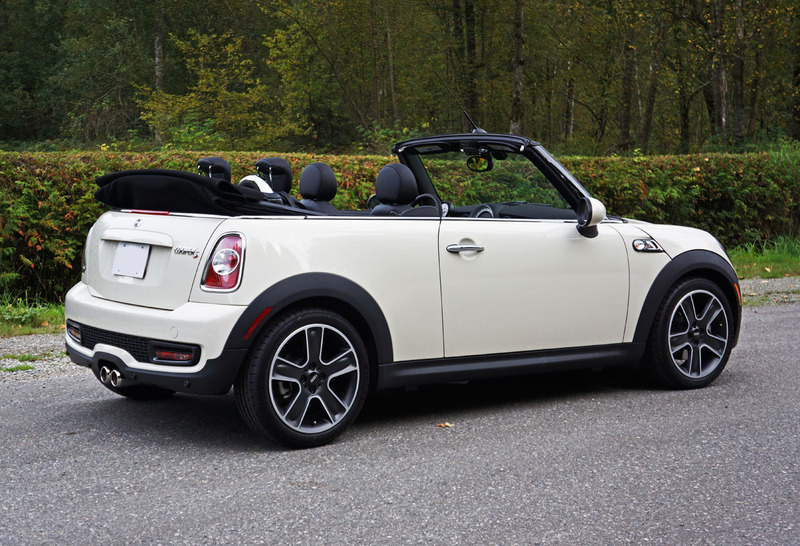 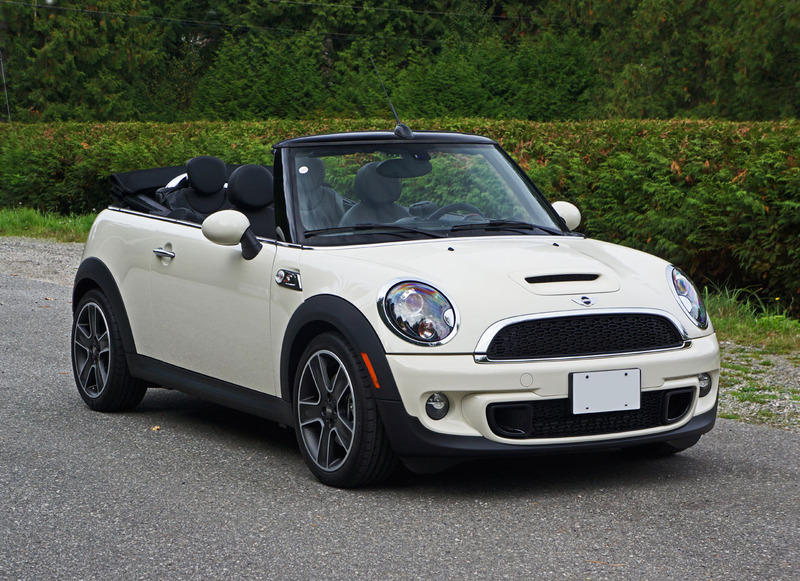 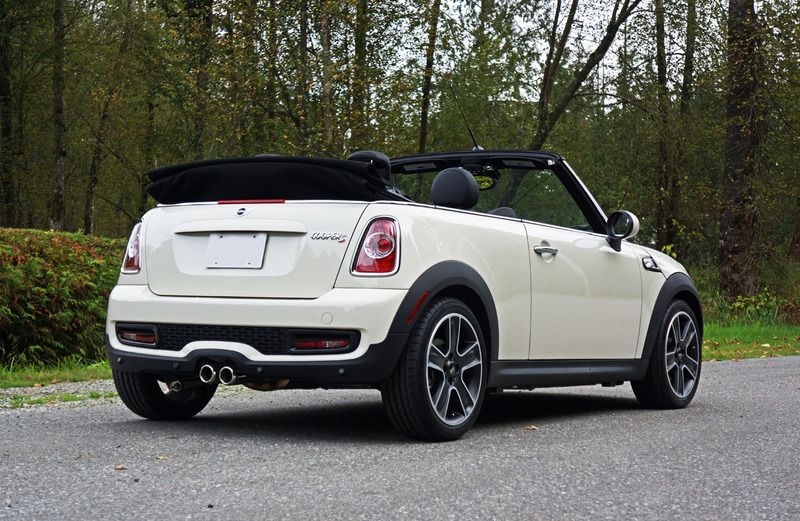 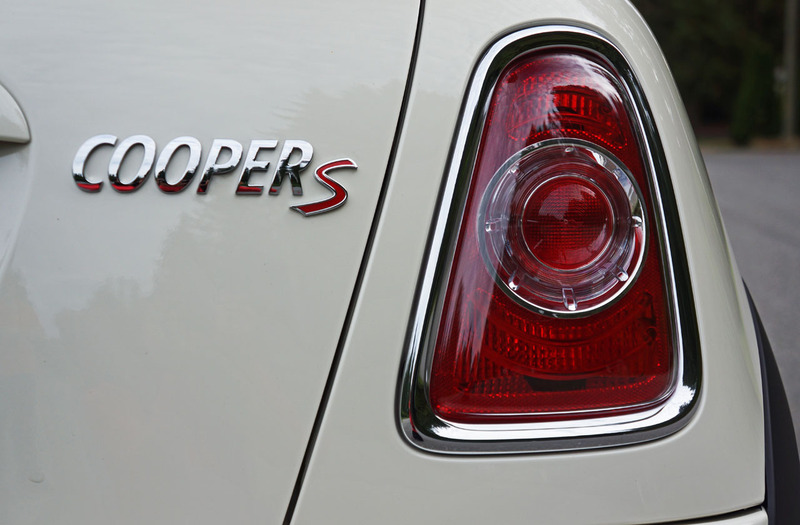 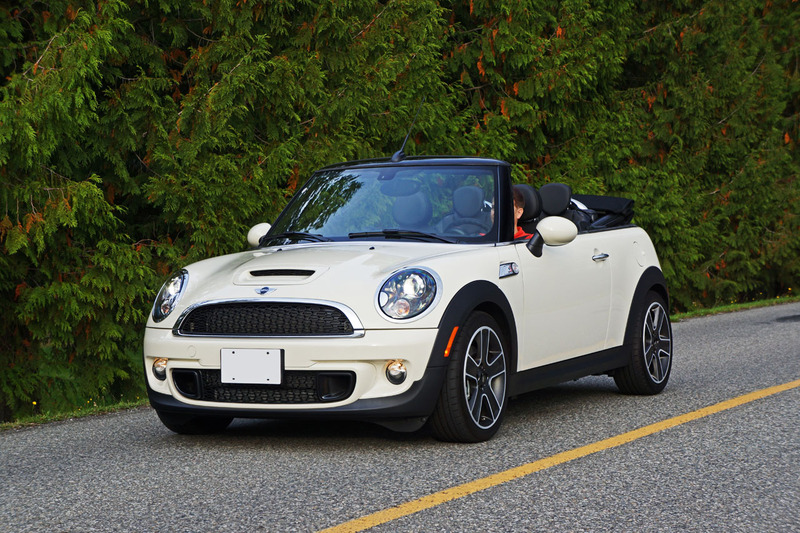 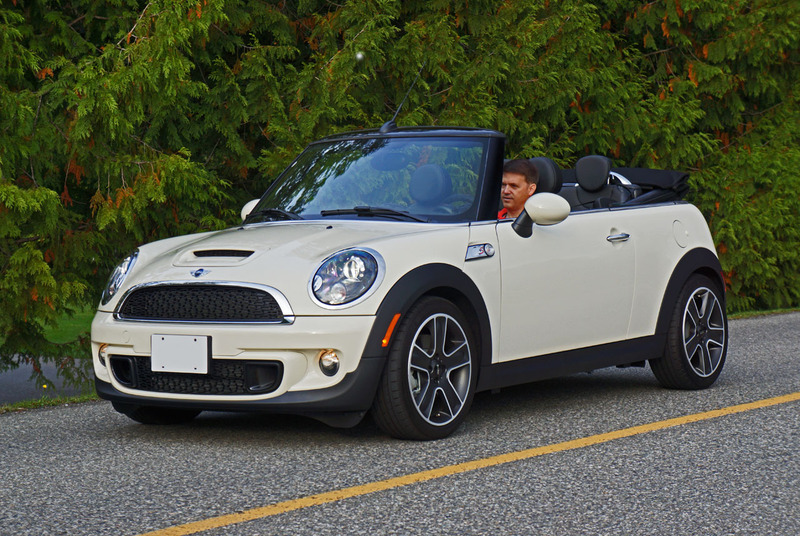 The little Cooper S drop-top lets you have your cake, eat it and share leftovers with your family and friends. 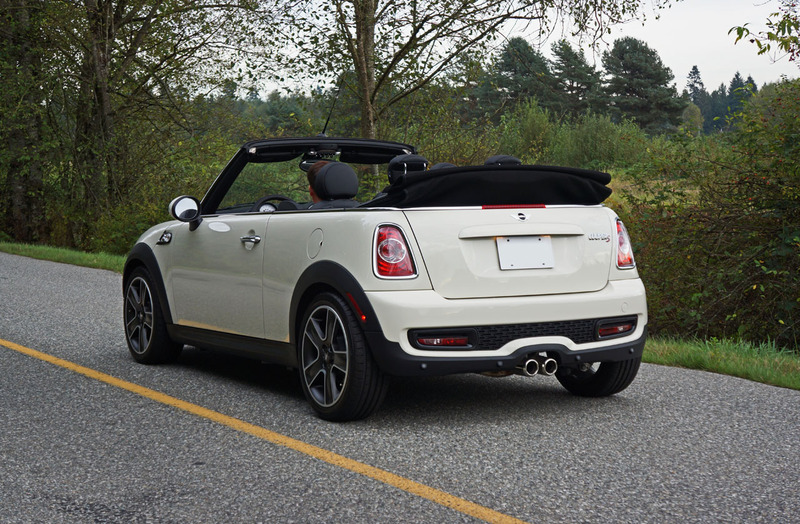 It’s fun, functionality and efficiency combined with loads of luxury and high-tech, for a wind in the hair experience like no other.